It wouldn’t be a Kayla trip without cramming in as many activities as possible in a short time frame. I’ll sleep when I’m dead! Seize the day! You only live once! 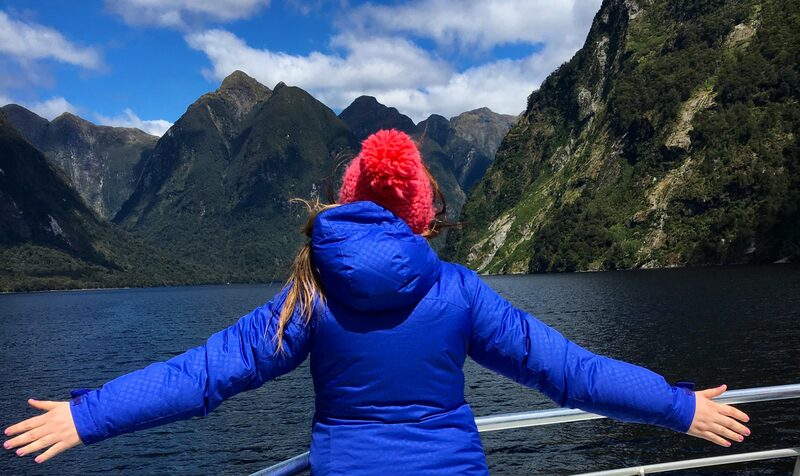 These cliched phrases are my mottoes when I travel. I never know when I’ll be back to a certain place so I want to see as much of it as possible while I’m there. 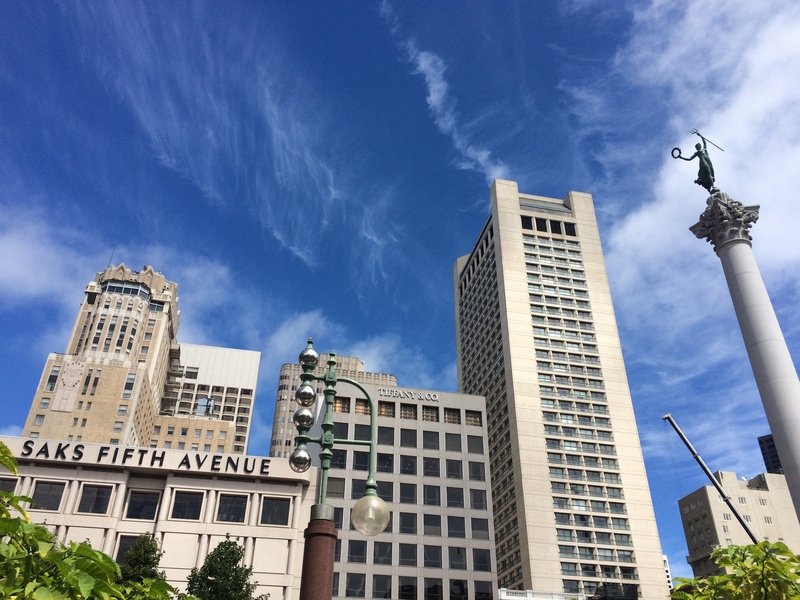 And my recent trip to San Francisco was no exception to my rule. My vacation began with a six hour drive from Los Angeles to meet up with my college friends who flew into San Francisco from the Midwest. I took the less scenic but fastest route from LA to SF which was up Interstate 5. Back in 2011 (before I started this blog) I took a trip to SF from LA but went up Highway 1 along the coast. It was a gorgeous drive but took about 12 hours due to the winding coastal roads. But for this trip I was more pressed for time and driving alone so the inland highway was my choice! After I picked up my friends we headed into the city and checked in early to our hotel Hotel Del Sol in the Marina District. If you want to stay in central yet quieter location and pay decent prices, I highly recommend Hotel Del Sol. They also had parking and free breakfast! A cute and perfectly decent boutique hotel for us! What is one’s first stop on arrival in San Francisco? FOOD of course! We walked to the nearby restaurant The Tipsy Pig (a recommendation from a friend in LA), enjoying the unusually warm weather in SF this time of year. 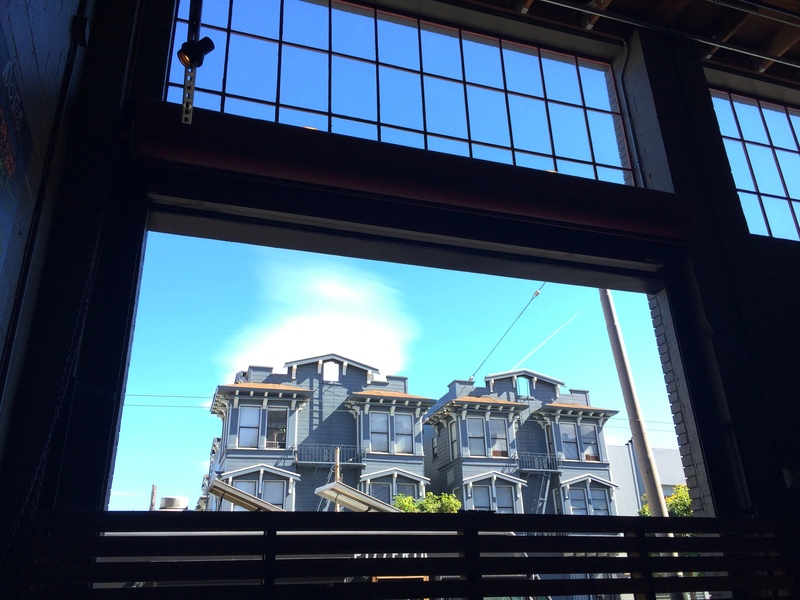 The Tipsy Pig is a charming pub and definitely recommend to anyone visiting SF! We ate outside sipping their deliciously fresh cocktail Strawberry Fields and sharing orders of Mac ‘n cheese, their burger and their chicken sandwich (which was our favorite!) I would love to see The Tipsy Pig’s night life too, but it was a great way to spend the afternoon catching up with friends! The perfect day for a walk to a pub for lunch! 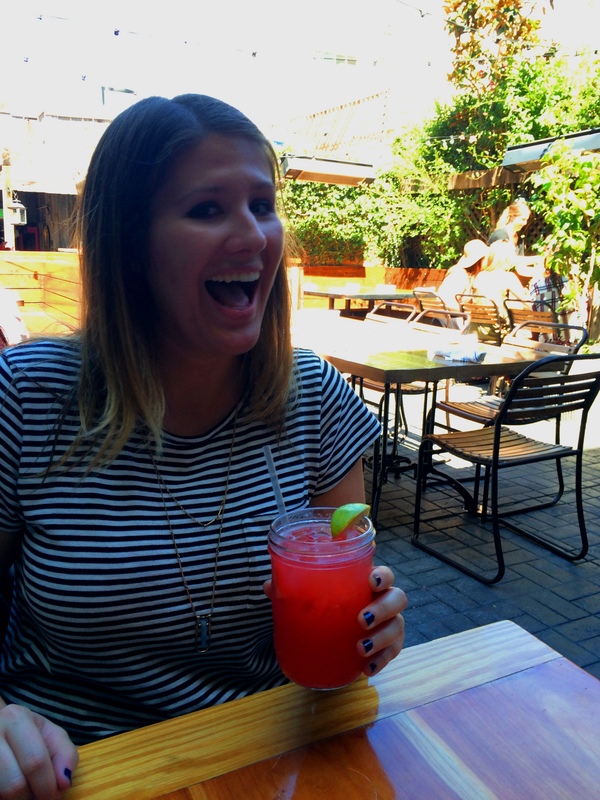 Enjoying the refreshing Strawberry Fields cocktail! Our next stop was to find a dive bar before the game! We walked through some sketchy areas to get there but we had a great time at Tempest! It seems to be a watering hole for people before the games as we met lots of Giants fans and even some Cardinals fans too while sipping cider and taking shots of Jameson. The bartenders were attentive and friendly and gave us great directions to walk to the stadium from the bar. Cheap drinks, low-key atmosphere and nice people made for an enjoyable evening before the game! 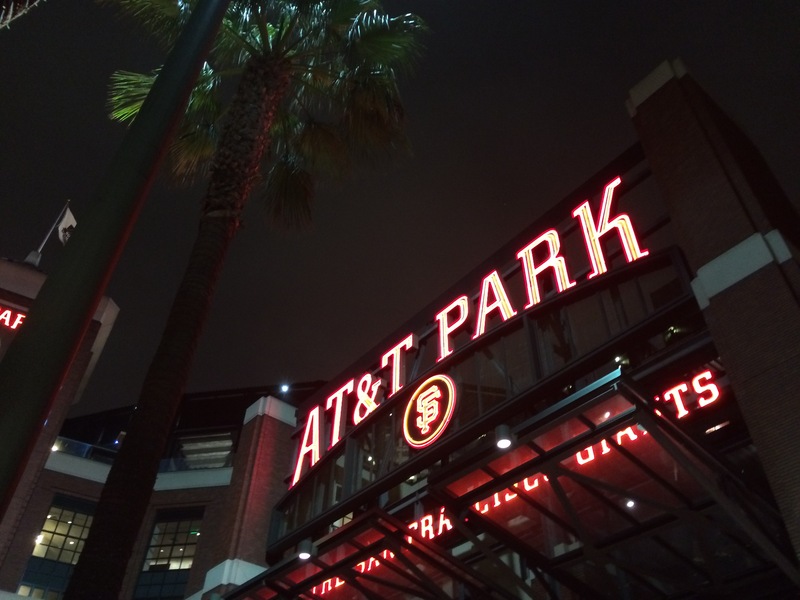 Even if you are not into baseball, I highly suggest attending a game at AT&T Park! Such a cool stadium with fabulous views of the bay. Since it was a night game we had the pleasure of watching the sun set there and it was amazing! 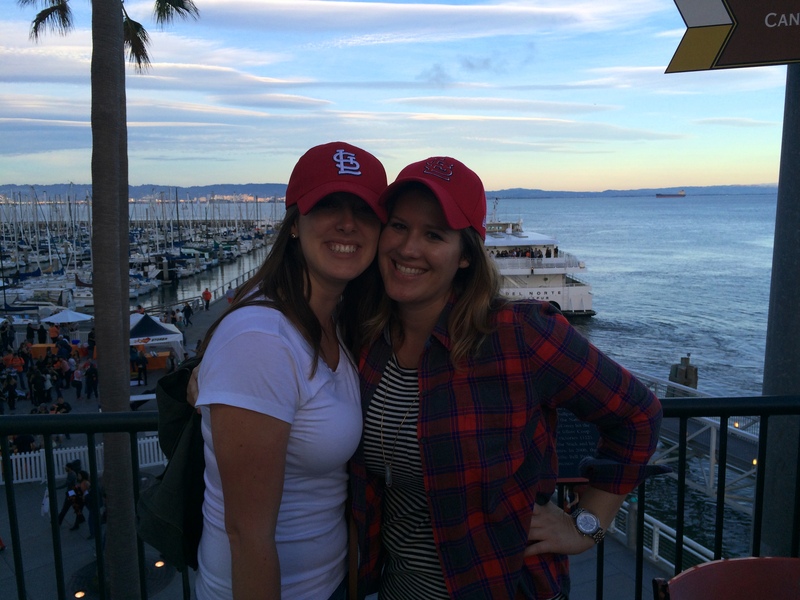 Sadly our Cardinals lost, but we were surrounded by such welcoming Giants fans that it was a great night! We made new friends, including two from Australia, and it was one of the most fun and funniest times I’ve had at a baseball game! 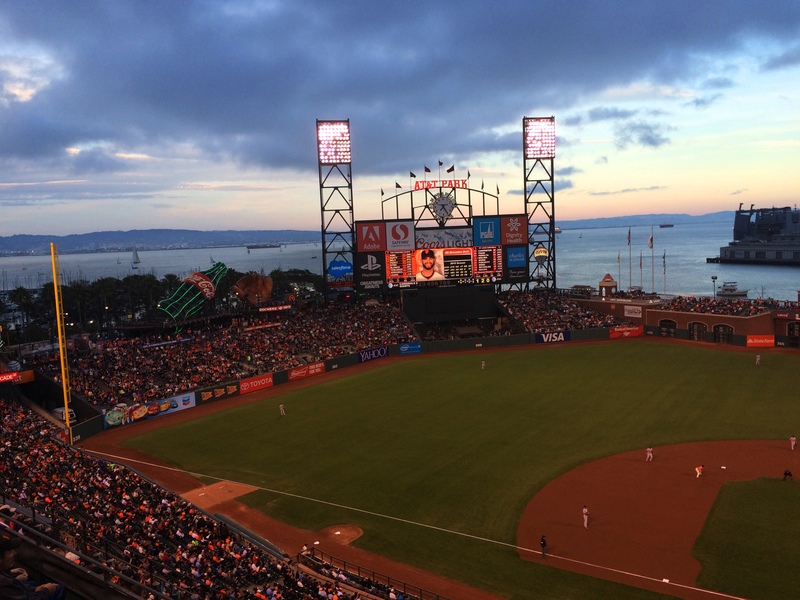 I haven’t been to many baseball stadiums, but AT&T Park has to have the best views! Baseball and a sunset over water, what a beautiful night! A great place to spend my first night in San Francisco! Day drinking = early to bed. But that also means early to rise and we had a full day of San Francisco sights to see on Saturday! We grabbed bagels from our hotel for breakfast, walked two blocks to the bus stop and hitched a bus ride to Fisherman’s Wharf where we bought our day passes for the MUNI (San Francisco’s public transit which includes the street cars, cable cars and buses). Since I’ve been to Fisherman’s Wharf before we didn’t stay long and hopped on a trolley to take us to our first tourist destination: the Crooked Street. 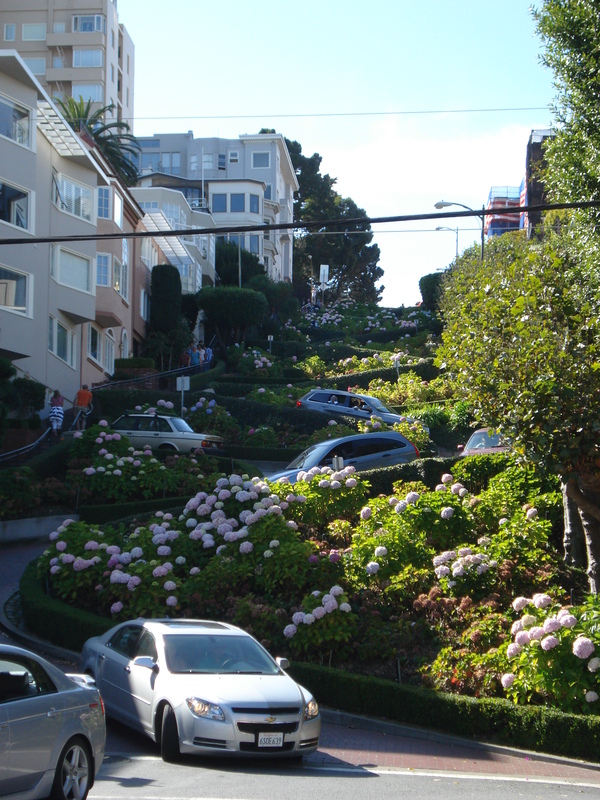 This one-block section of Lombard Street is famous for it’s eight hairpin turns, which gives it claim to being the most crooked street in the world. 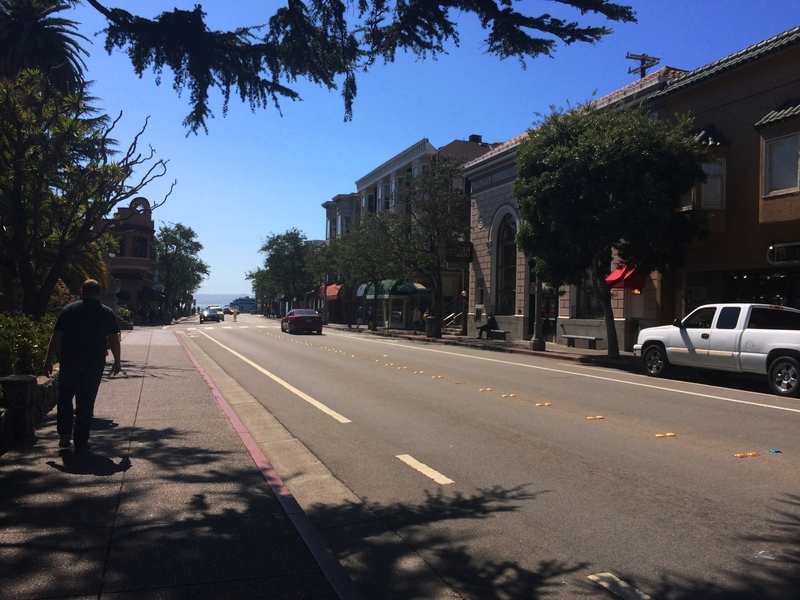 The road was built in 1922 to reduce the hill’s steep grade and has since become a famous feature for San Francisco! First tourist stop for the day! 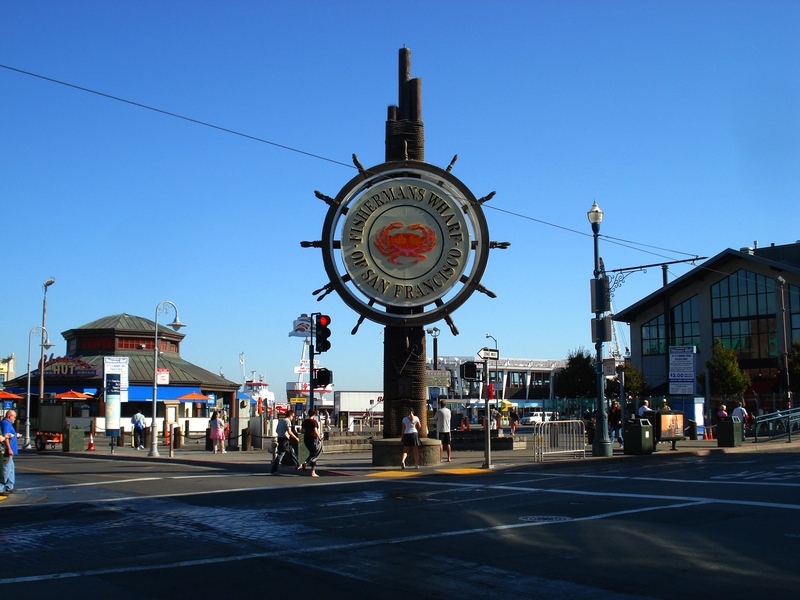 Fisherman’s Wharf started in the mid to late 1800s when Italian immigrant fishermen came to San Francisco during the gold rush. 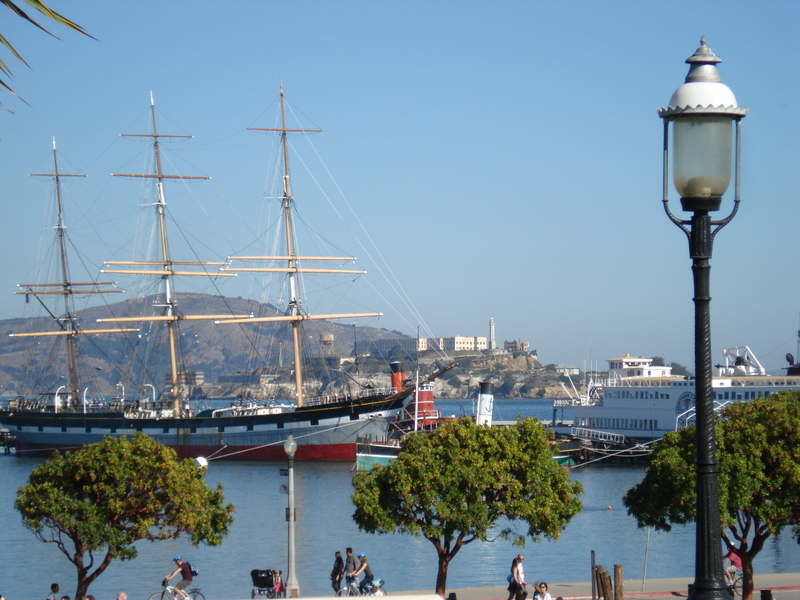 A historic vessel docked at the Wharf with Alcatraz visible in the background. 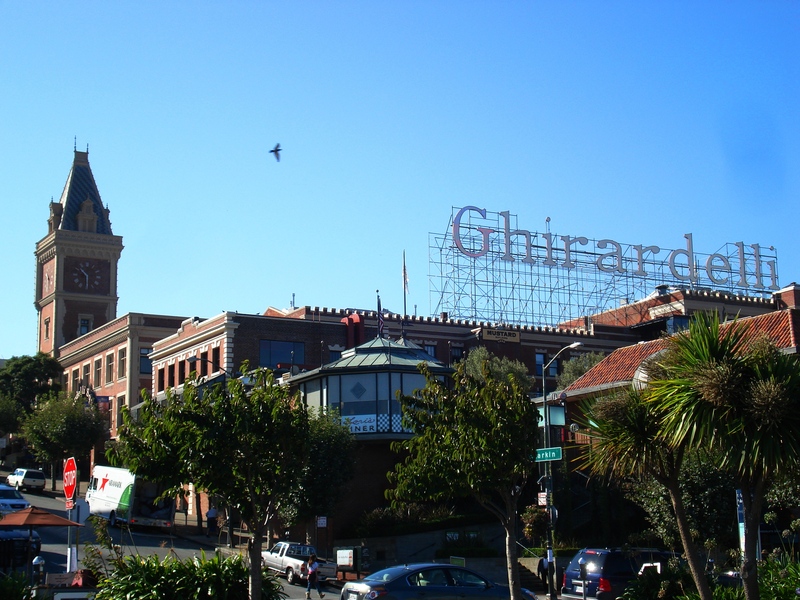 We treated ourselves to Ghirardelli’s amazing ice cream sundaes later in the afternoon! The Crooked Street is a slow crawling 5 miles per hour. From the top of the crooked street we hopped back on the trolley and took it to Union Square. We just walked around snapping photos before we decided to add in a little shopping! One hat and pair of earrings later we were on our way via bus to Alamo Square for a date with the Painted Ladies. “Painted Lady” is a phrase to describe Victorian houses painted in three or more colors that emphasize the house’s architectural details. 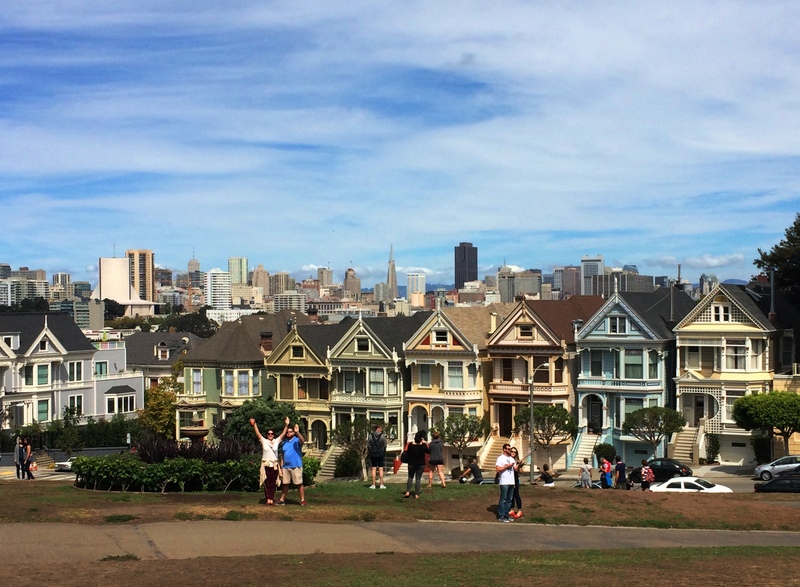 The Painted Ladies in San Francisco consists of seven homes near Alamo Square that were built between 1892 and 1896 and are embellished with multiple pastel colors. 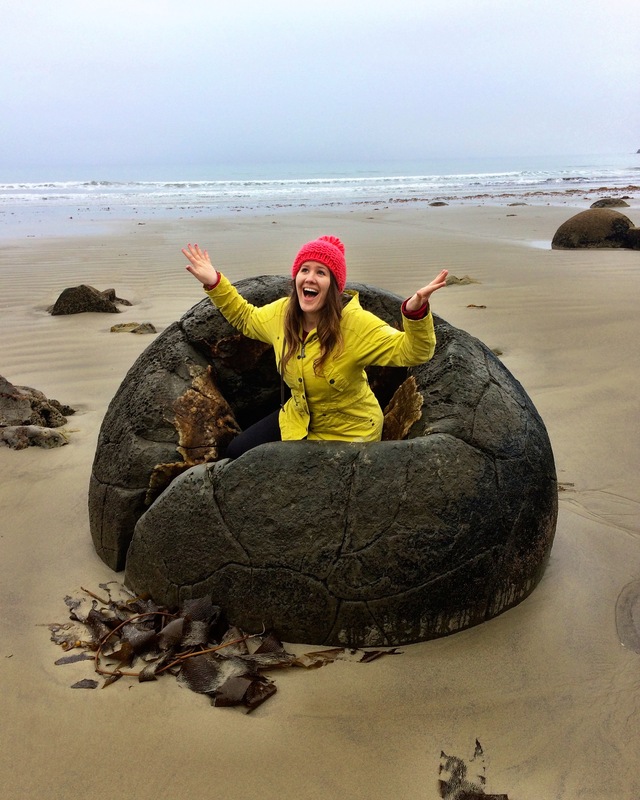 It’s a fun tourist attraction in SF that is featured in many movies and television shows! 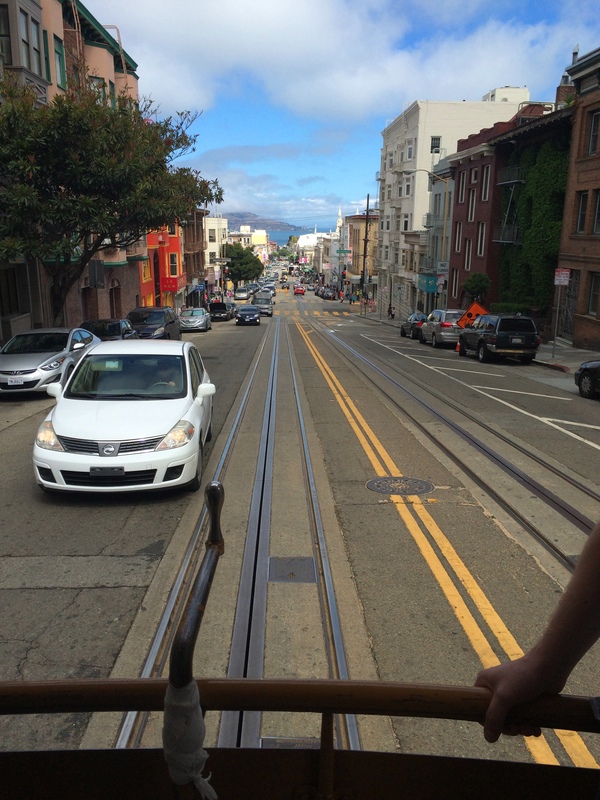 A view out the back of the trolley on the way to Union Square! Pretty ladies at the Painted Ladies! 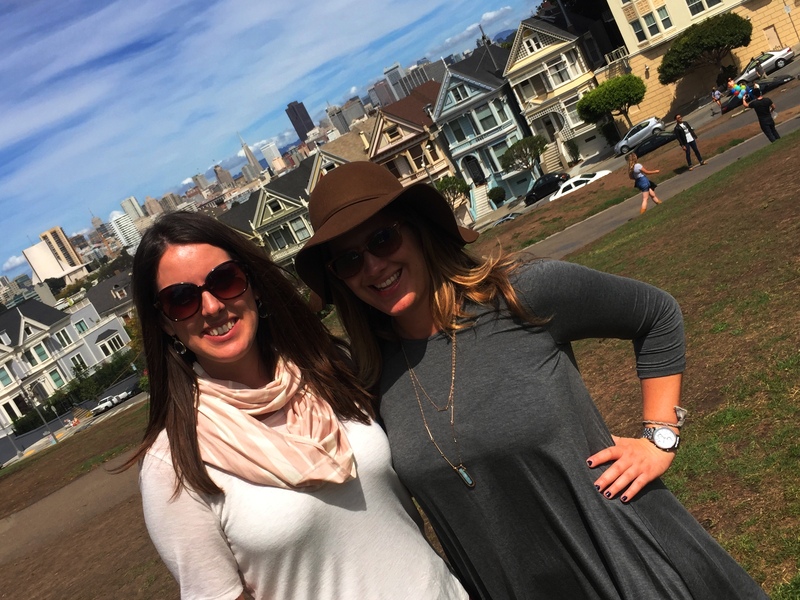 On the hill in Alamo Square with an overlook of the Painted Ladies and San Francisco skyline. 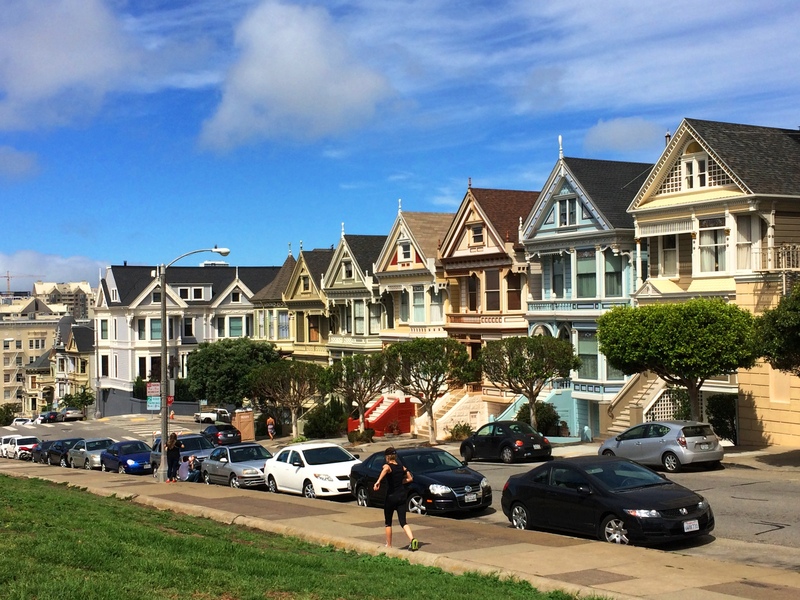 Many of the Victorian houses were destroyed in the 1906 earthquake, but this row survived the disaster and are now a famous icon of San Francisco, in part thanks to the TV show “Full House”. It was like Mother Nature playing a joke on us because aside from the fog around the bridge it was a sunny day. 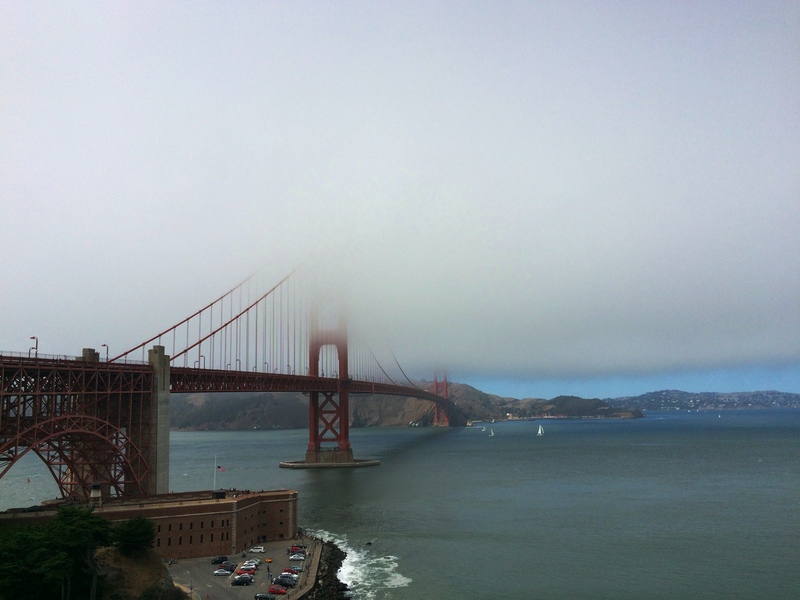 Panoramic of two of San Francisco’s famous features: Golden Gate Bridge and fog. 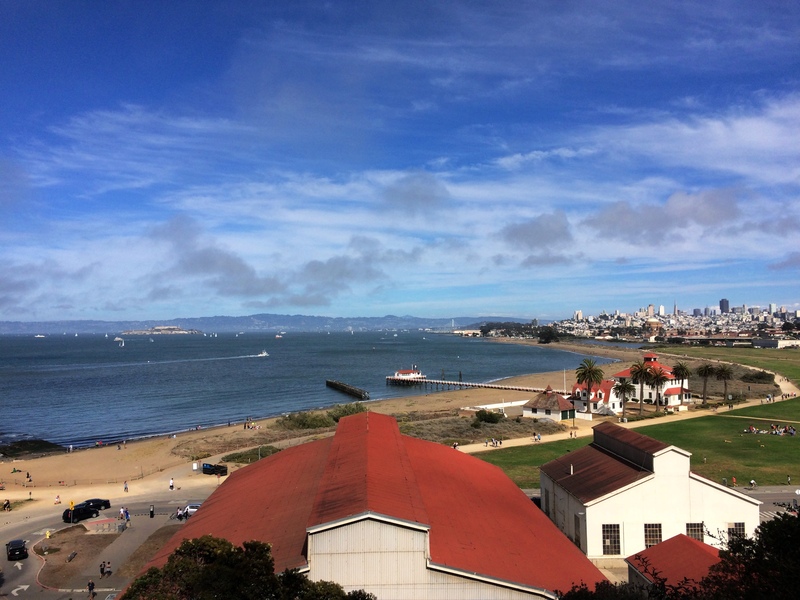 Crissy Field and the bay. A beautiful night for stuffing our tummies with seafood! After dinner it was another early to bed night because we were getting up with the sun on Sunday to drive to Yosemite! We surprised ourselves and were on the road to Yosemite National Park by 6:30am! The drive from San Francisco to the Yosemite Valley Visitor Center is four hours so we knew we had to be on the road no later than 7am otherwise the drive would not be worth doing. 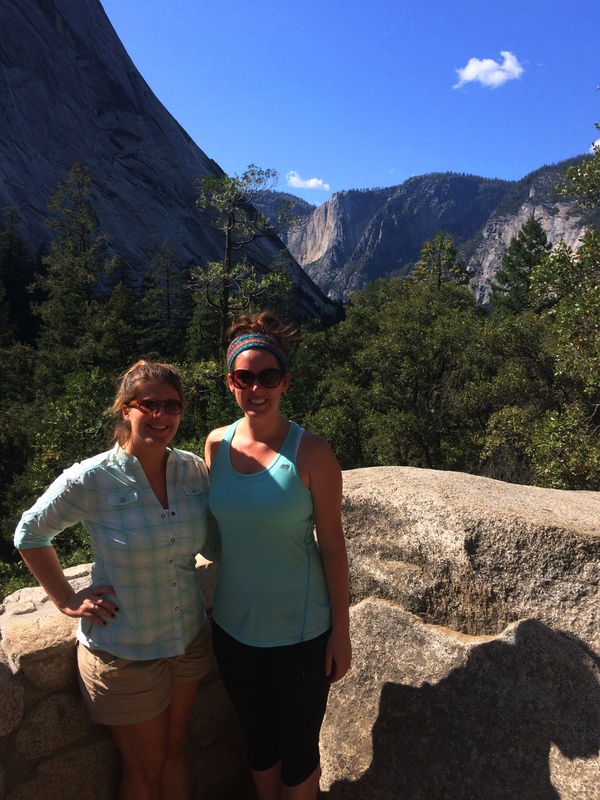 Thankfully we encountered zero traffic and actually made it to Yosemite in three and a half hours! 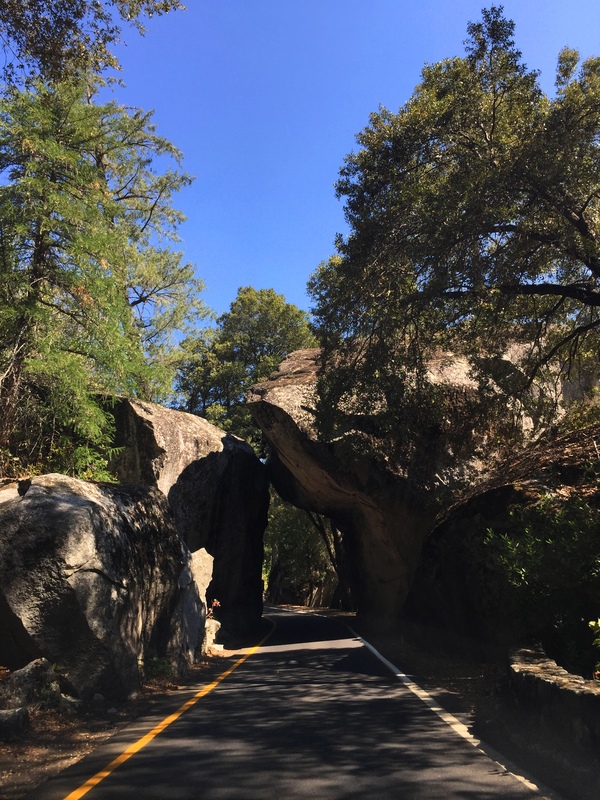 The rock archway at the west entrance to Yosemite! 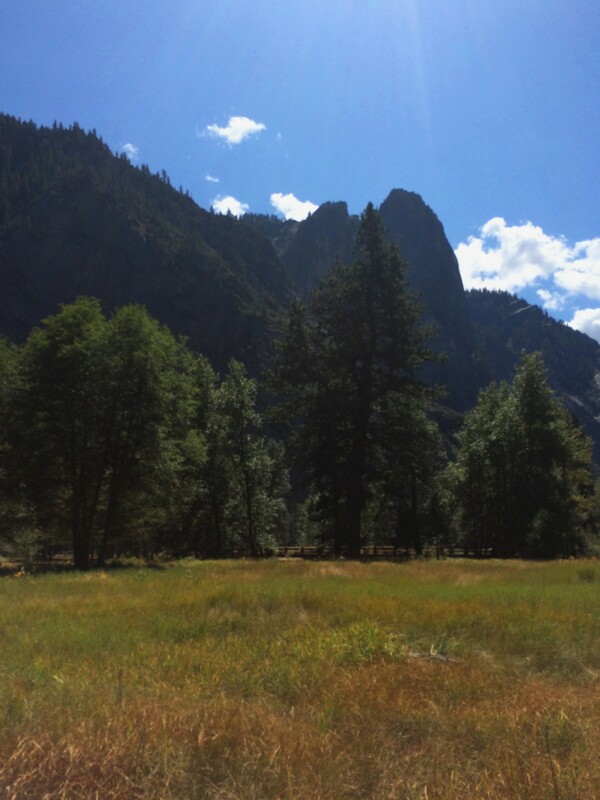 Before reaching the Yosemite Valley Visitor Center we made a couple of scenic stops. 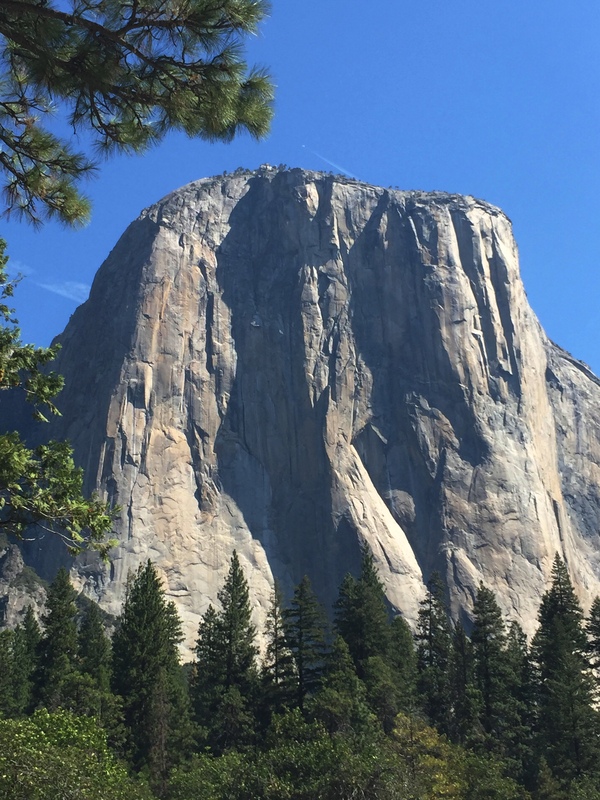 First we hopped out of the car to get a better look at the famous Yosemite site, El Capitan! Next up, we stopped after seeing a group of people at Swinging Bridge and decided to check it out. Our main reason for stopping at Swinging Bridge was to walk across a swinging bridge…but alas, there is no swinging bridge here! We were tricked! lol. (Though there is an actual swinging bridge elsewhere in the park at Wawona Swinging Bridge.) But Swinging Bridge was still a beautiful walk along the river and during the spring you can see Yosemite Falls from here. But since we were visiting at the end of summer, sadly no waterfall and the river was pretty low too. Swinging Bridge is a great stop to picnic, cool off in the river, and enjoy stretching your legs! Often times with binoculars you can see rock climbers on the granite! The water is very low right now but still gorgeous with the mountain backdrop! 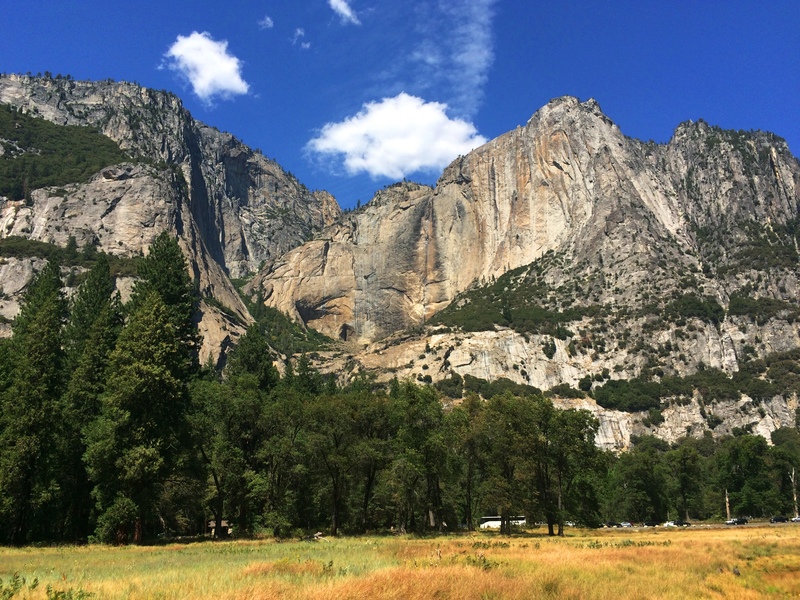 Our saving grace for experiencing Yosemite Valley in one day is the park’s free shuttle service. Yes, I said free! After parking in day parking lot we hopped on a shuttle that took us to Yosemite Village. From there you can hop on several shuttles that will take you to other sites in the park. 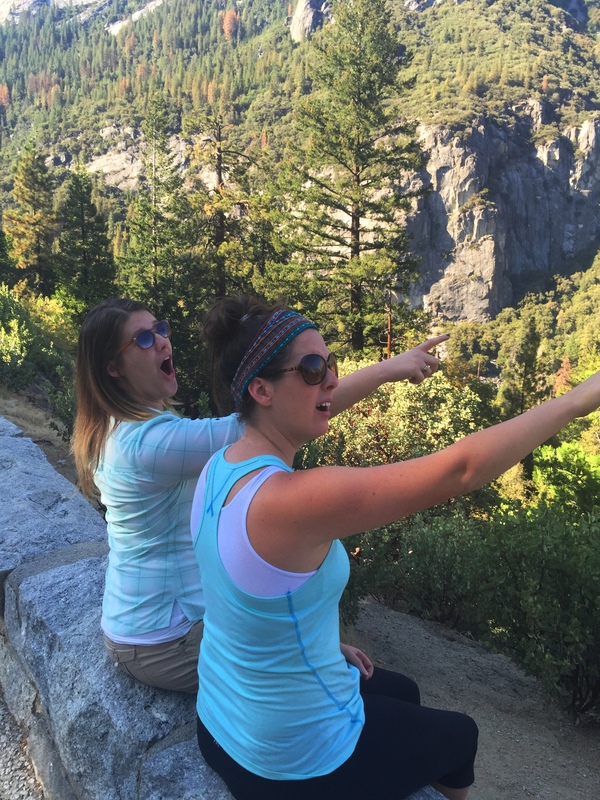 But first we headed to the visitor center to ask a guide the best things to do in our few hours at Yosemite. 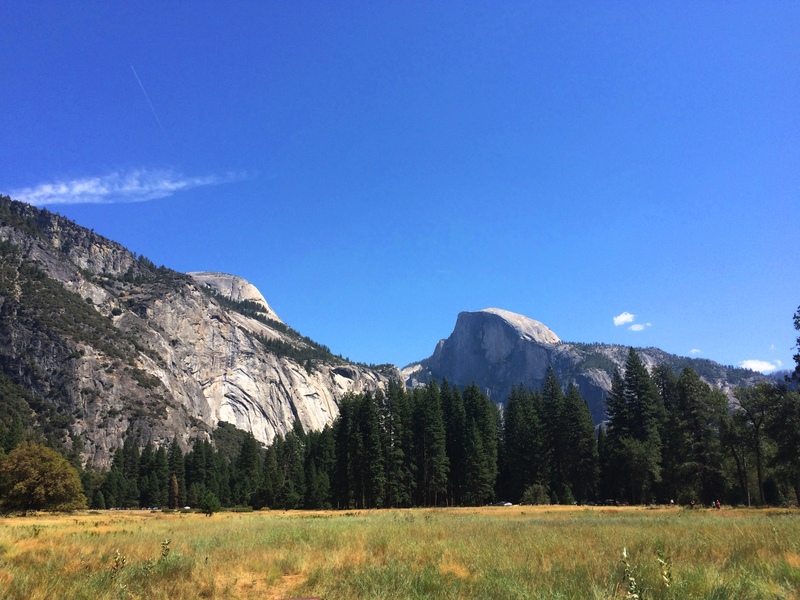 A friendly volunteer suggested we head to Cook’s Meadow to see a great view of Half Dome, Sentinel Rock and Upper Yosemite Falls. 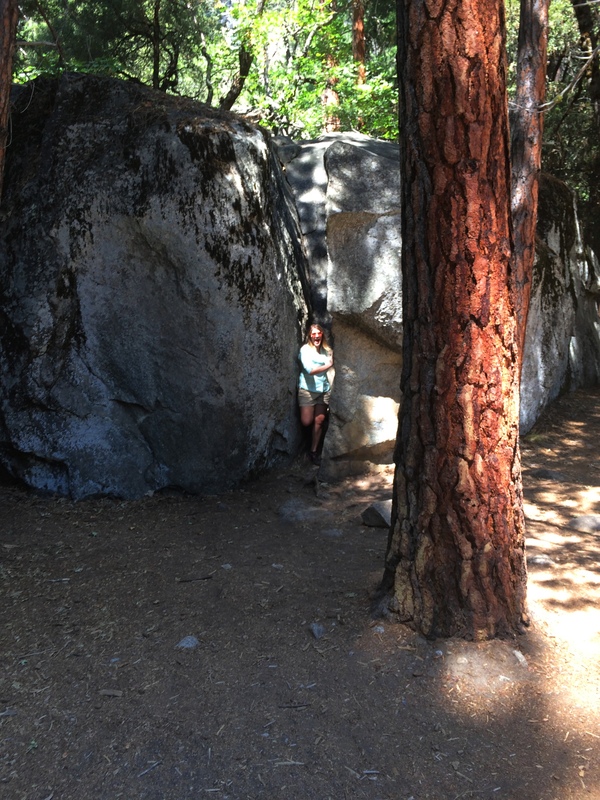 She said it is her favorite place in the entire park because you are in a beautiful meadow surrounded by granite walls. 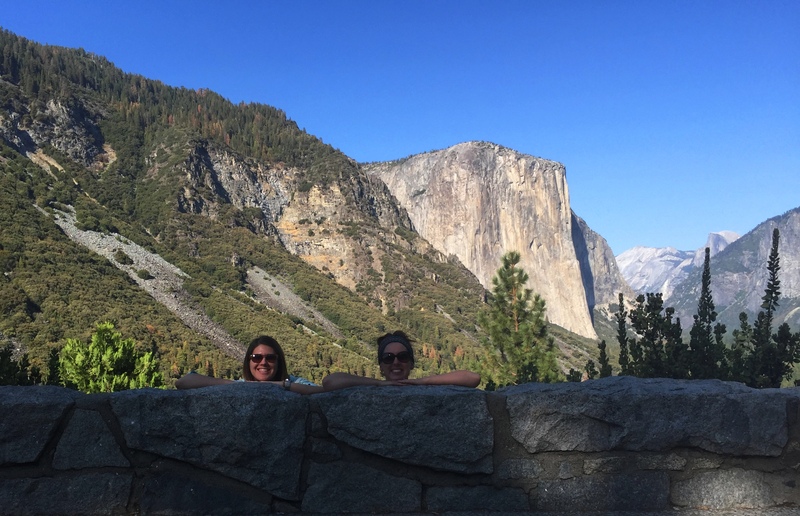 With our plan set, we made a quick stop at Degnan’s Deli for delicious sandwiches and then headed to our first shuttle stop at Yosemite Falls. 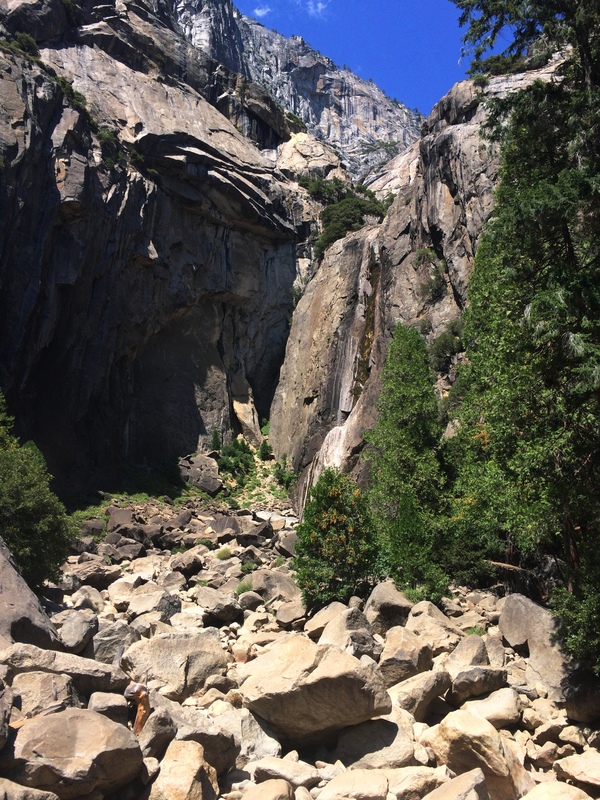 Due to time and also the lack of water at Yosemite Falls, we only walked to Lower Yosemite Falls. 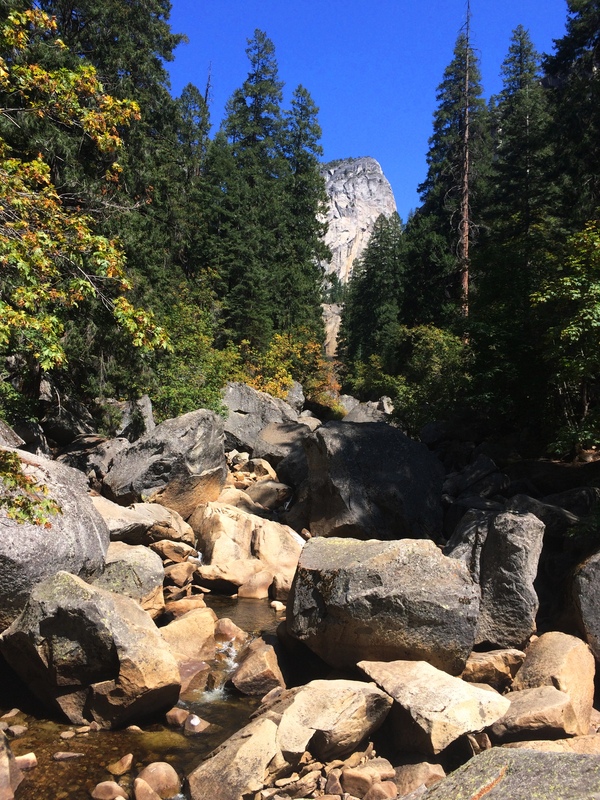 Of course if you continue on the trail it will take you to Upper Yosemite Falls. I’ll have to come back in the Spring when the snow melts and the waterfalls are at their fullest! 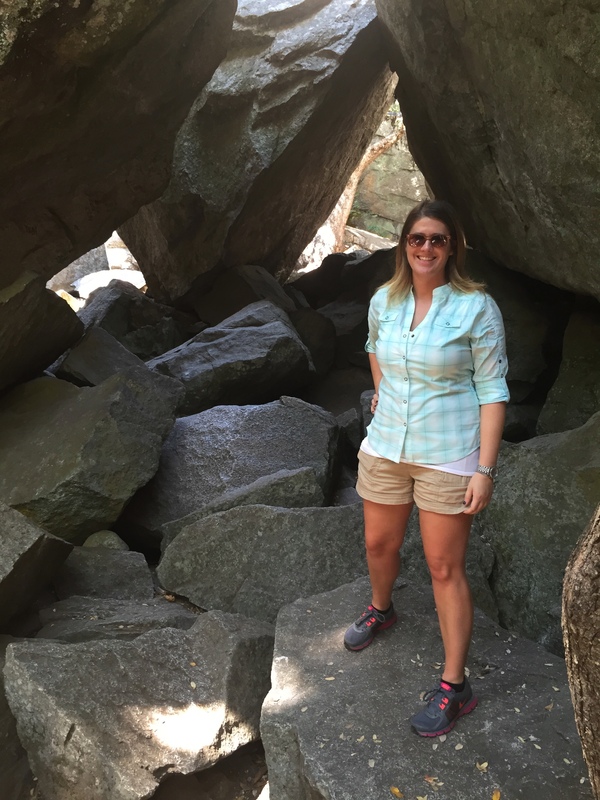 Lower Yosemite Falls is a very easy and paved hike for anyone to do! You can see where the water stained the rock and imagine a roaring waterfall there! From Yosemite Falls it is a brief walk across the road to Cook’s Meadow. 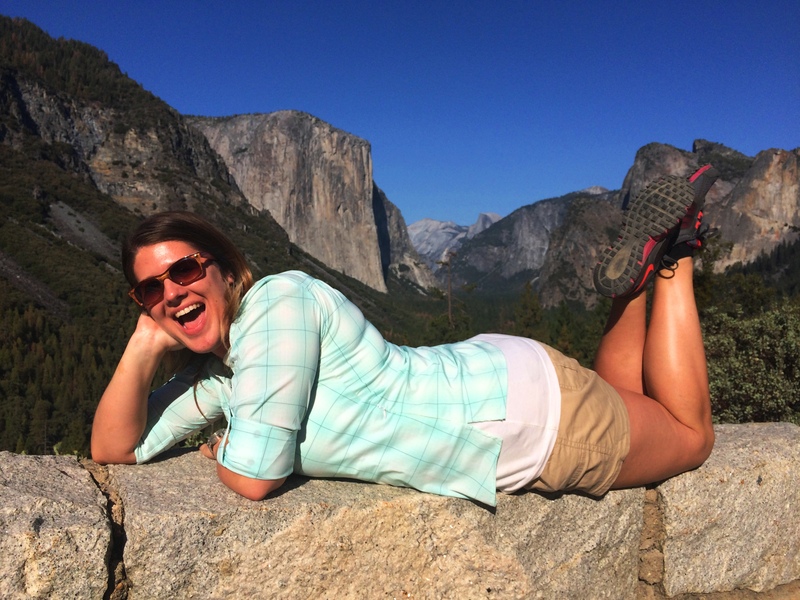 Here we were treated to breathtaking views of Half Dome (Yosemite’s most famous site), Upper Yosemite Falls (though no waterfall this time of year), and Sentinel Rock. 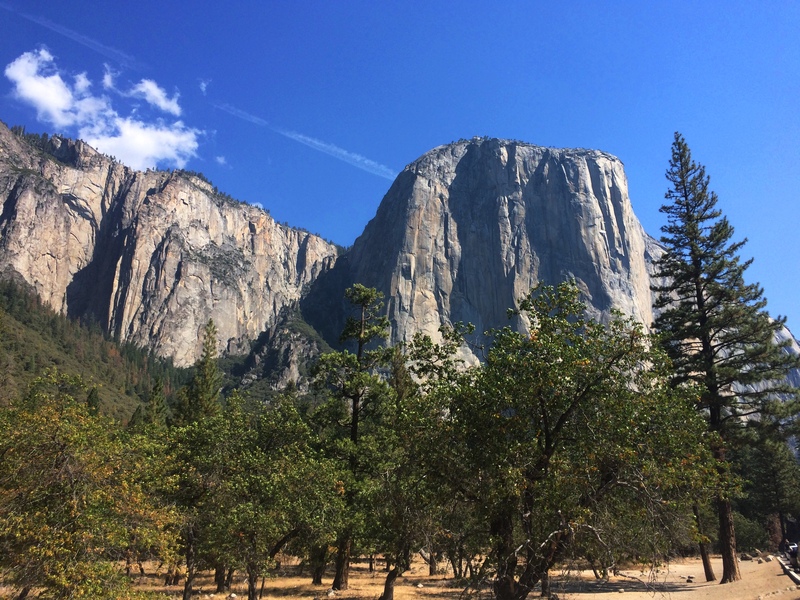 The volunteer at the visitor center was right: this is a gorgeous place to be in the park and might be my favorite in Yosemite too! We were lucky to be alone most of our time in Cook’s Meadow where we could enjoy taking in the views and the peaceful atmosphere. And to also snap lots of photos of course haha. 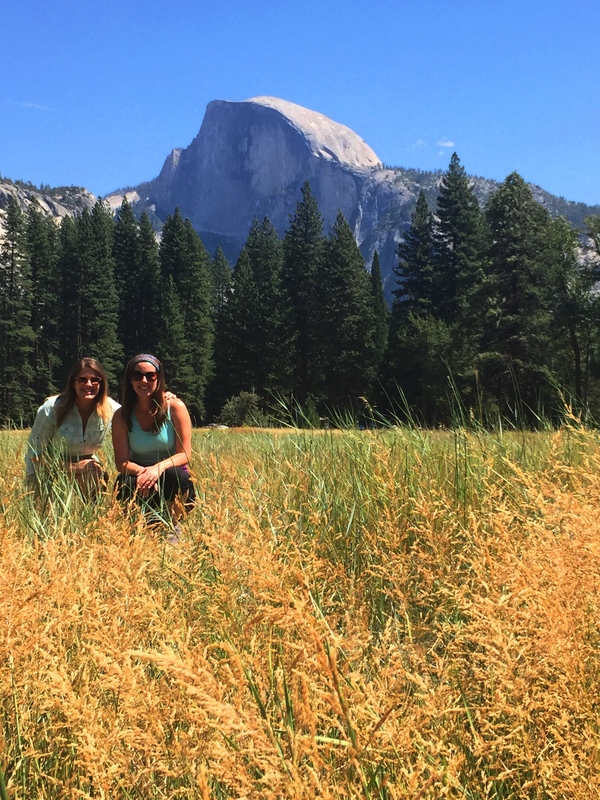 Yosemite’s most iconic feature, Half Dome! I love the vibrant colors in Yosemite! From Cook’s Meadow we hopped on the shuttle to Vernal Fall. This hike was our main exercise activity for the day and we would finally be able to see a waterfall! The Vernal Fall Footbridge hike is labeled as “moderate” but for me it was more strenuous due to me being out of shape haha. It’s 1.6 miles roundtrip and takes about 1-1.5 hours, though we hiked a little further up the trail past the footbridge. 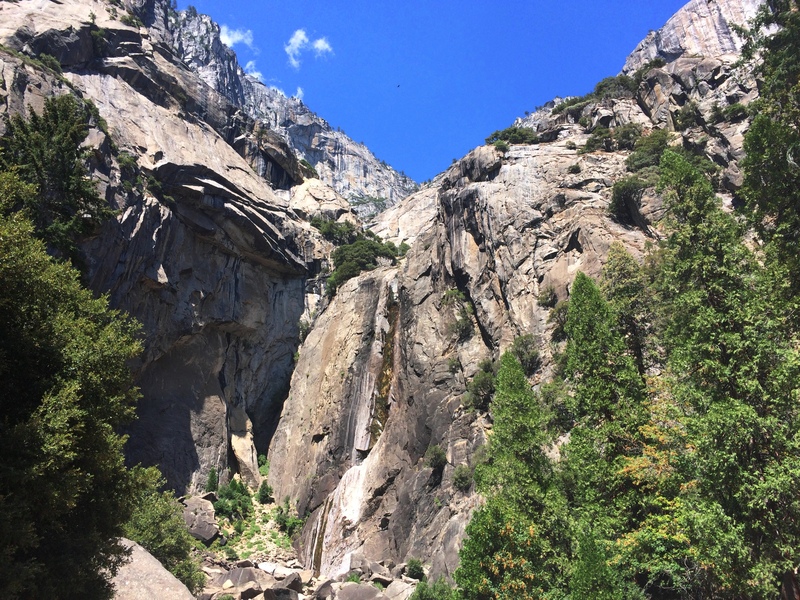 This is a very popular hike in Yosemite that takes you on the Johh Muir and Mist Trails which offer breathtaking views of two waterfalls, Vernal Fall and Nevada Fall. 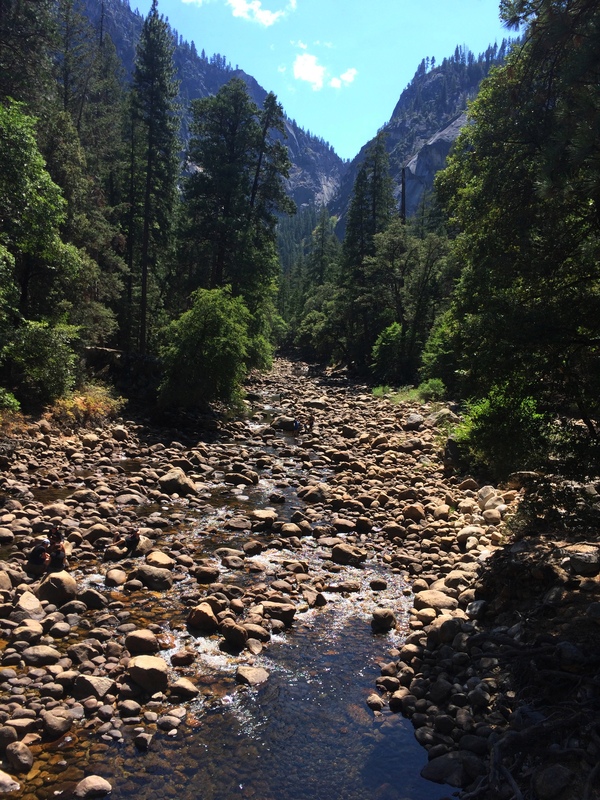 This scenic trail is almost entirely uphill (hence me making numerous stops) as it follows the Merced River with beautiful views across Yosemite Valley. Very low water in the river bed, but such lush scenery around it! 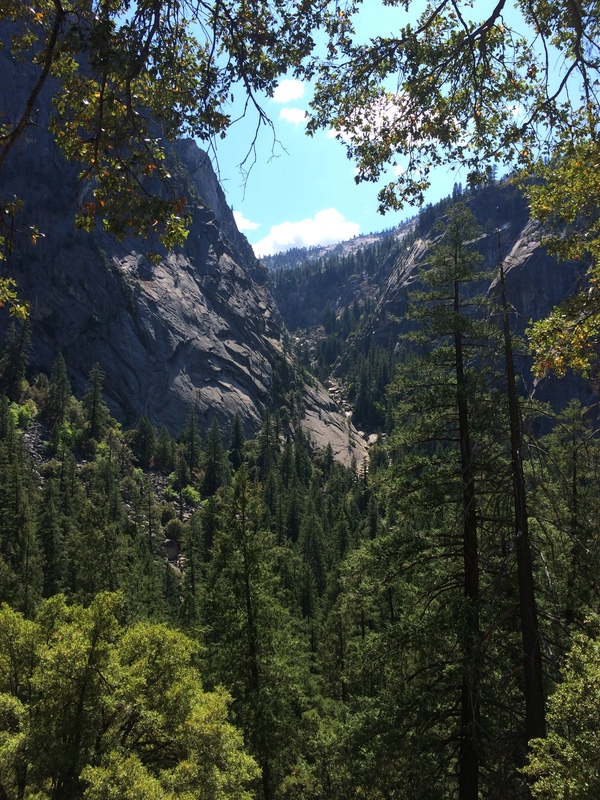 A stunning view of Yosemite Valley on our trek up to Vernal Fall. We made it to the Vernal Fall Footbridge! This is about the halfway point to the top of Vernal Fall. 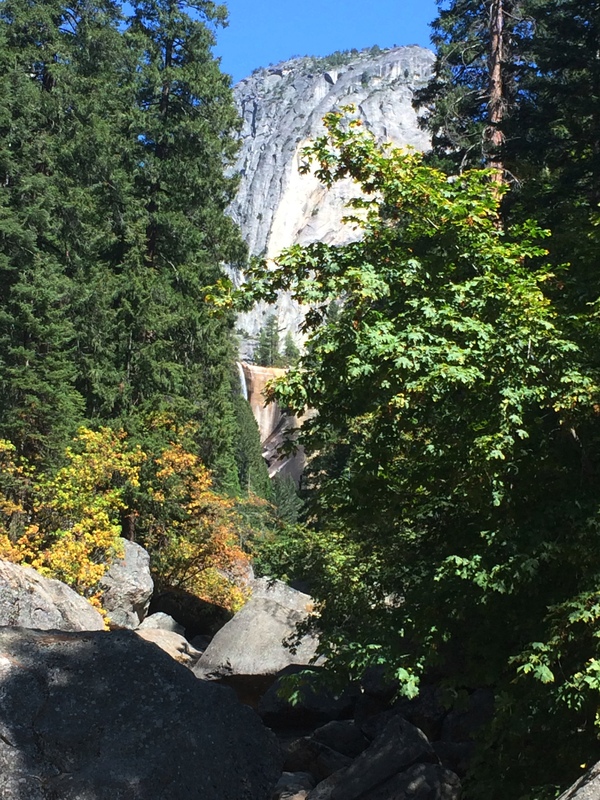 Gorgeous scenery at Vernal Fall! I would love to visit in the Spring when the waterfall is roaring! In the distance you can just barely see Vernal Fall. This view is from the footbridge. When you reach the footbridge at 0.8 miles you get a great view of Vernal Fall! There is also a large water fountain here and restrooms. 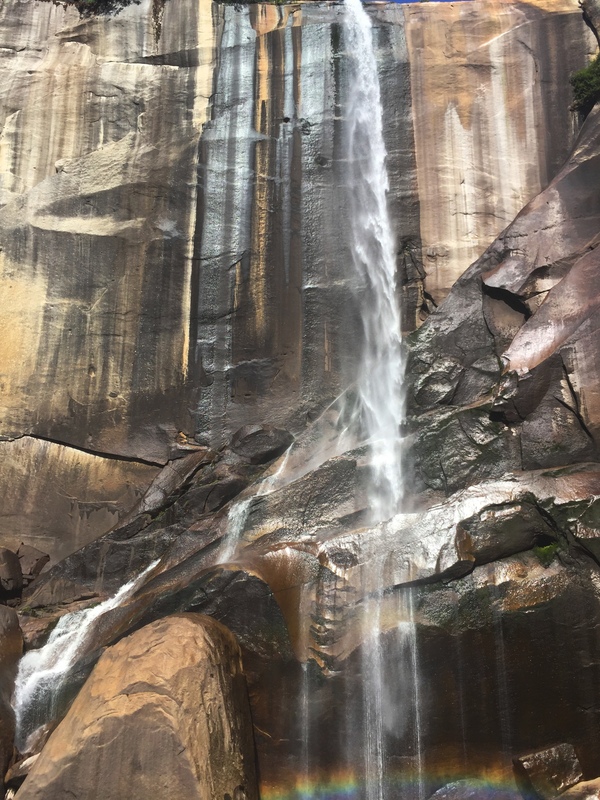 From here if you continue on the steep trail you can reach the top of Vernal Fall, via the Mist Trail, and experience the cascading 317-foot waterfall from above which I imagine is spectacular! 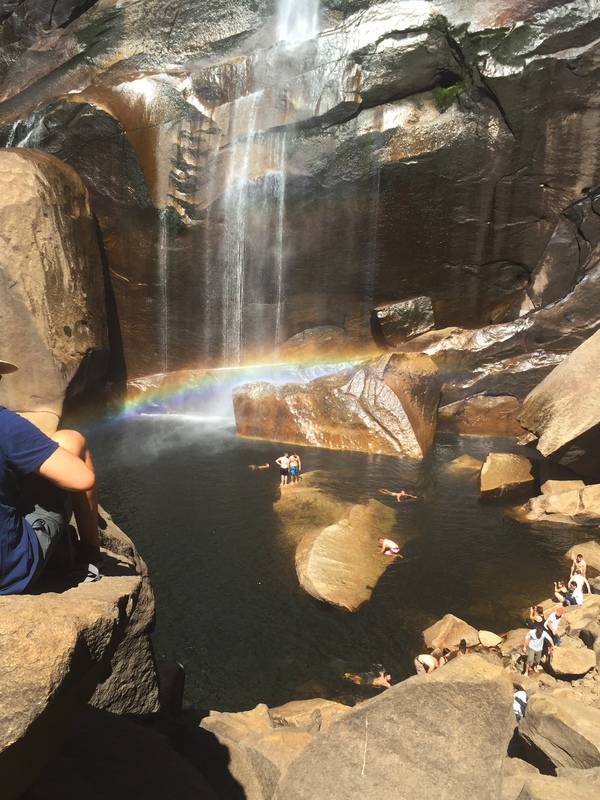 We only went partially up the Mist Trail to a stretch of the trail that offers closer views of Vernal Fall where we were treated to a rainbow! Lots of people hiked down to the pool at the bottom of the fall to cool off in the water but we opted to turn around and head back down the trail to the footbridge. If we continued on for another hour or so on the Mist Trail we would have reached the top of Vernal Fall. 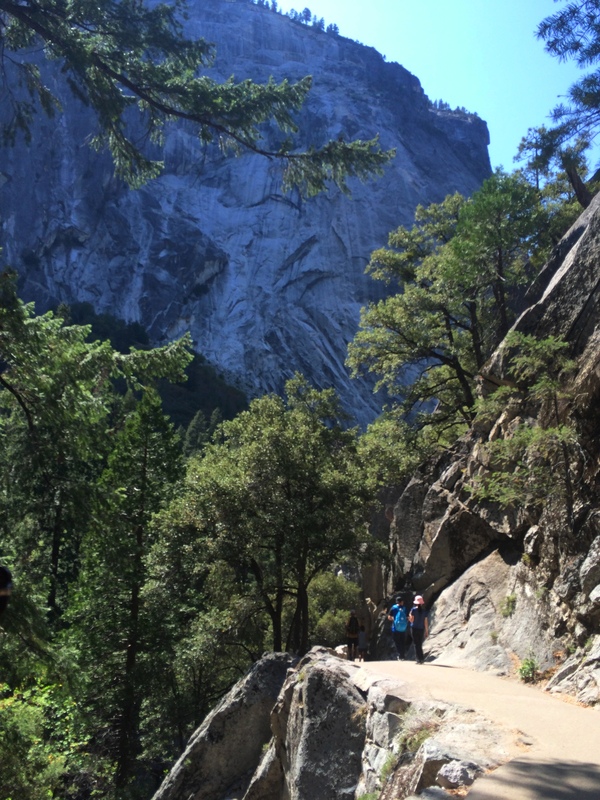 From there you can then turn around and go back the way you came, or continue up and take the longer way back via the John Muir Trail, or continue farther uphill on the Mist Trail to Nevada Fall. Vernal Fall from the Mist Trail! 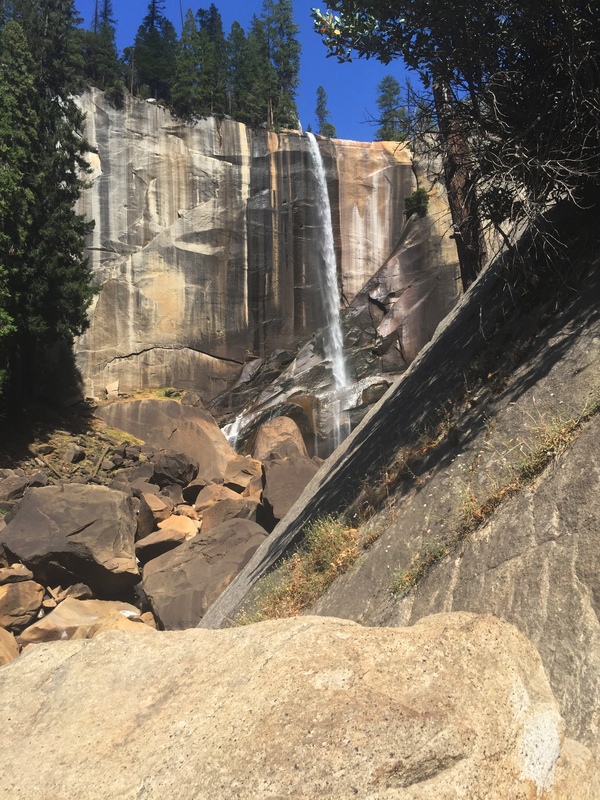 In the Spring, after the snow melts, Vernal Fall is at least 10x bigger than this! The first mile of the trail is the busiest to the Vernal Fall Footbridge. 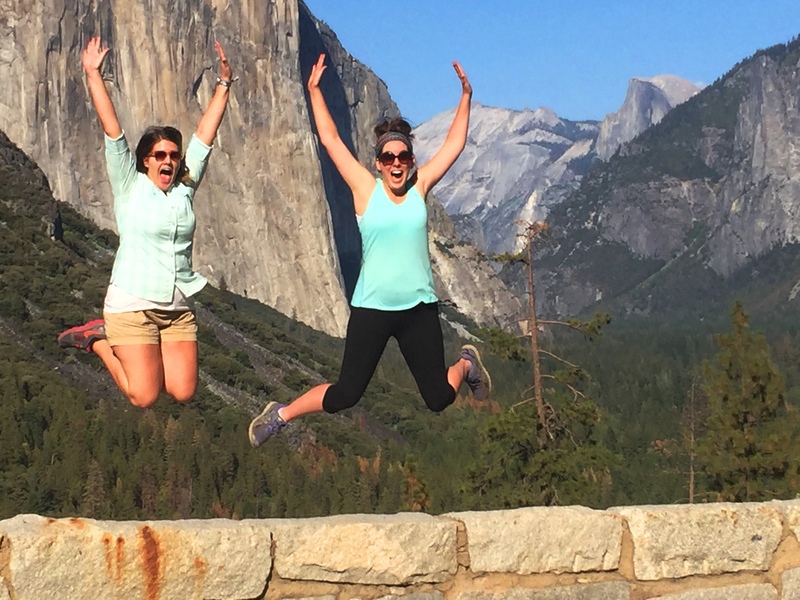 Tunnel View offers expansive views of Yosemite Valley, El Capitan, Bridalveil Fall and Half Dome. 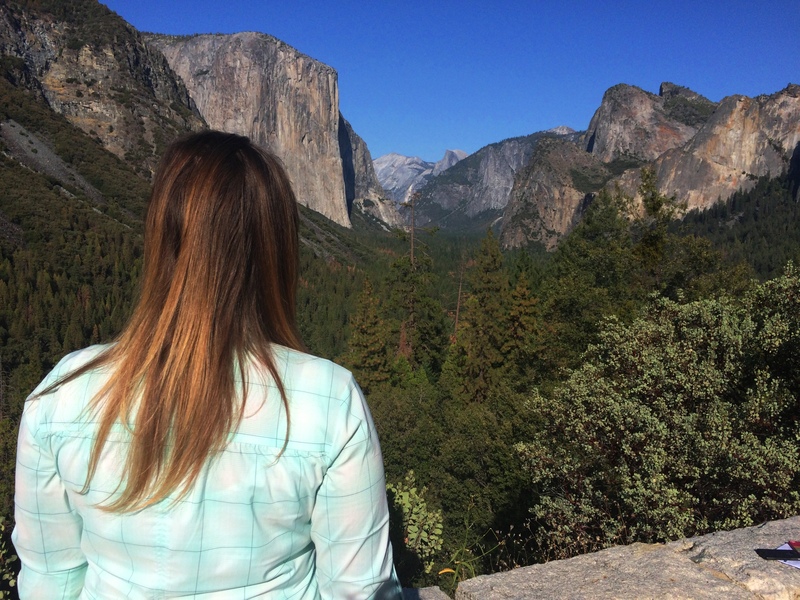 In case y’all were wondering what the back of my head looked like…plus with a view of Yosemite Valley! This was probably my favorite day of our trip. 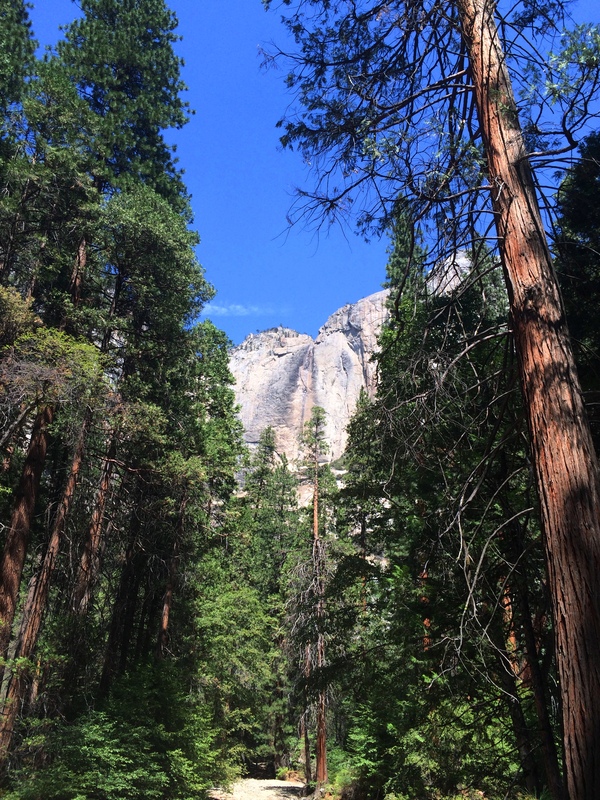 Yosemite is gorgeous! 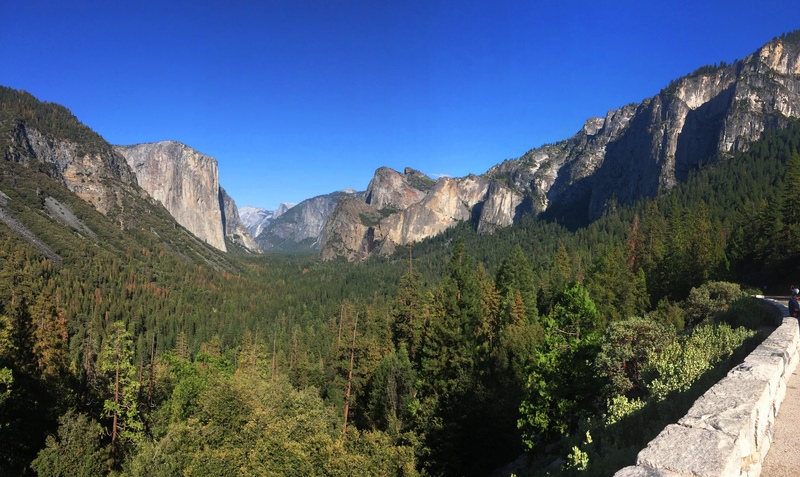 Since we only had about 5-6 hours of daylight we stayed in Yosemite Valley, where most of the famous sights are located, even though the park is enormous! 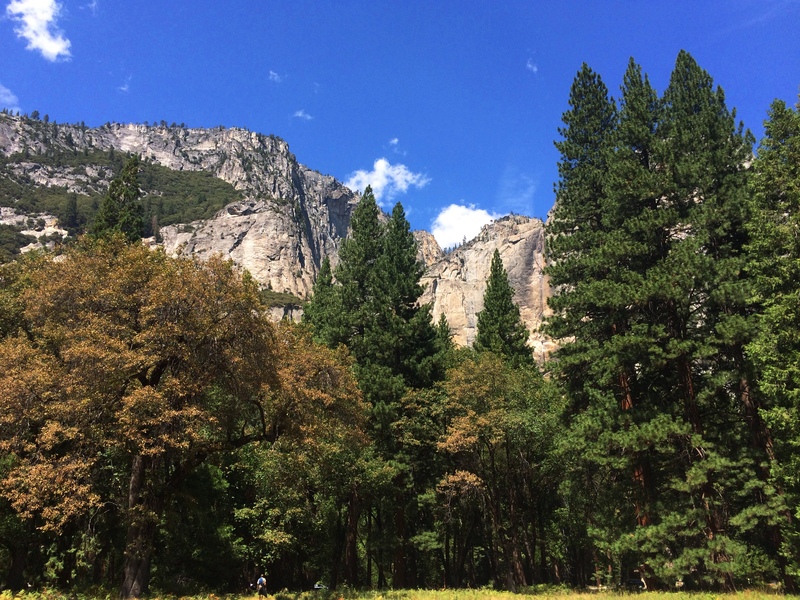 The ease of parking near the visitor’s center and taking the free shuttles between the sites was such a time saver and allowed us to see what we wanted in Yosemite Valley. 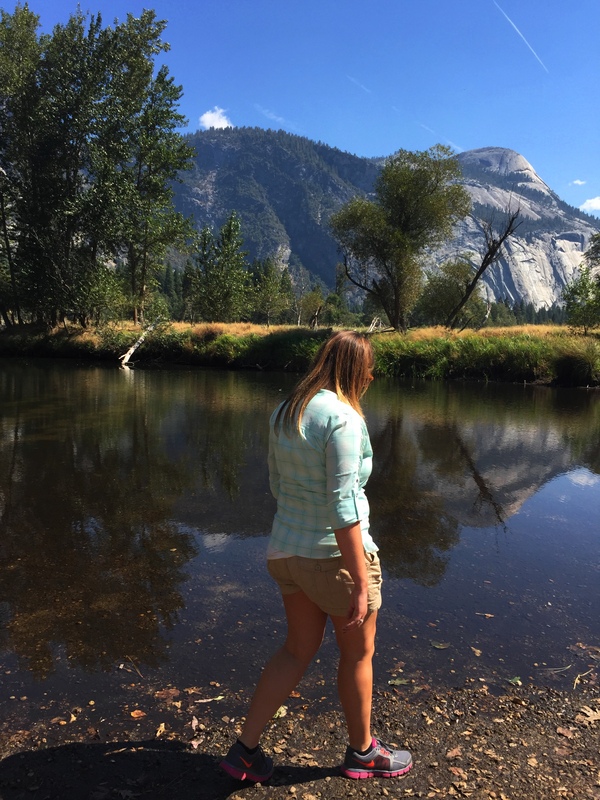 I can’t wait to go back and spend much more time in Yosemite National Park and hopefully my return visit will be sooner rather than later! Monday morning was another early riser for us! 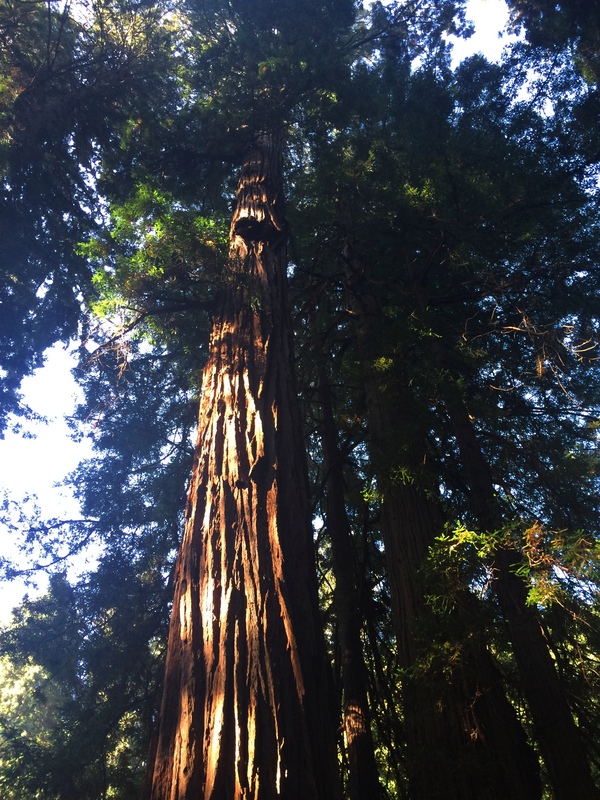 We were not done exploring nature this trip and we were on the road by 8am to reach Muir Woods, 11 miles north of Golden Gate Bridge, before the crowds. Thankfully we followed the advice of previous travelers and arrived early to secure a parking spot in their limited space and arrive before a majority of people. 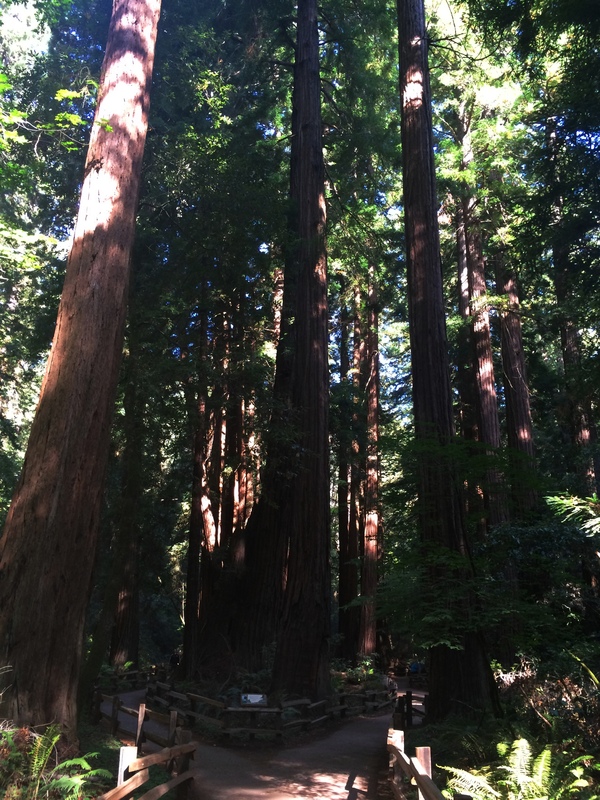 Muir Woods National Monument is an incredibly serene and beautiful forest of redwoods that lies in the middle of the Coastal Redwood range that spans from the California/Oregon border to Big Sur. 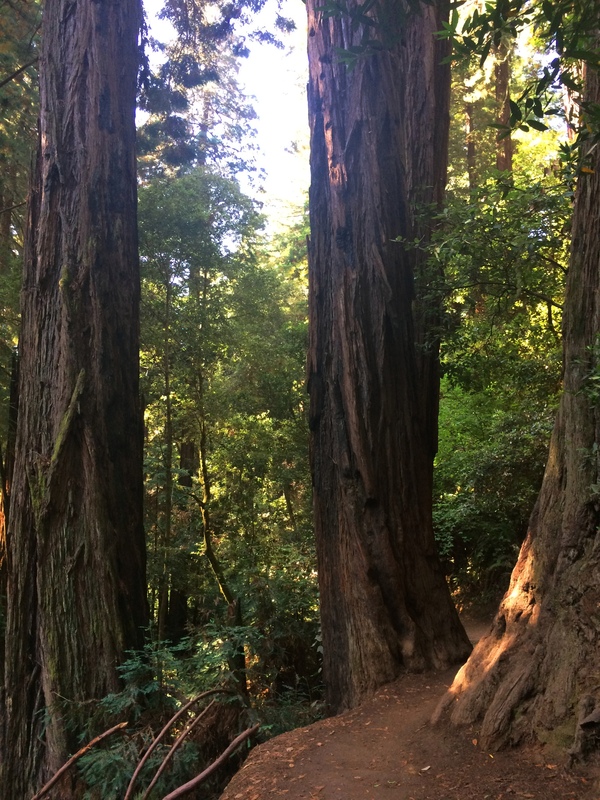 Muir Woods National Monument is essentially one giant loop of mostly paved or boardwalked trail that took us about 1.5 hours to walk at a leisurely pace. 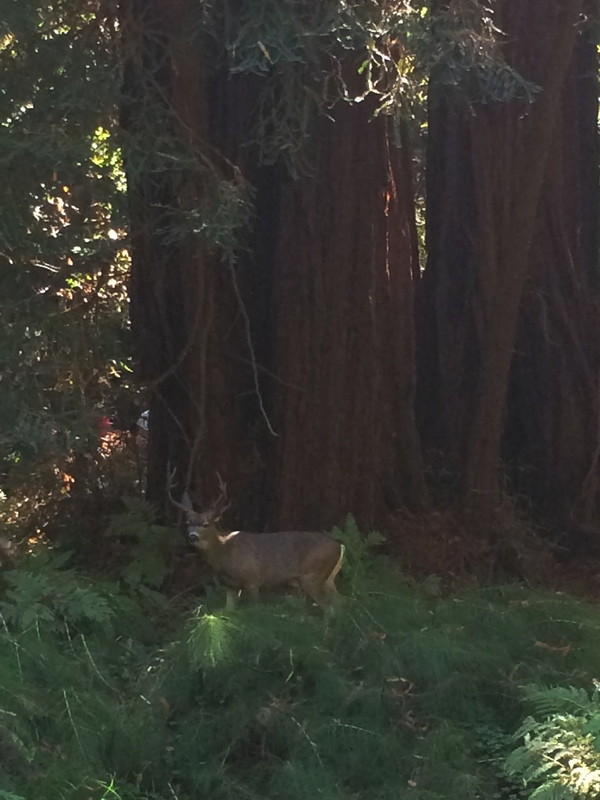 While walking through Muir Woods, we were treated to a couple deer sightings. Animals are commonly seen in the forest due to the quiet environment. 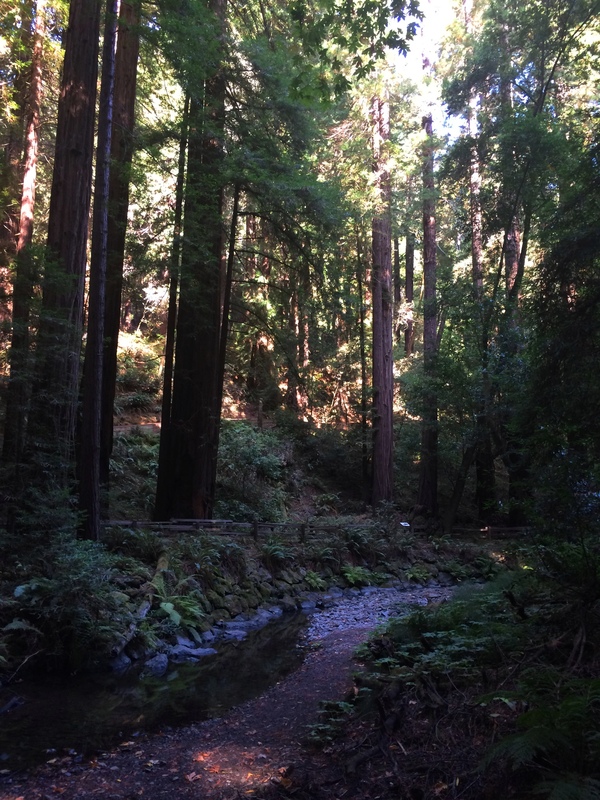 I loved visiting the vibrant and lush Muir Woods early in the morning because since it so tranquil it felt like a meditation. No wonder it is such a popular destination! 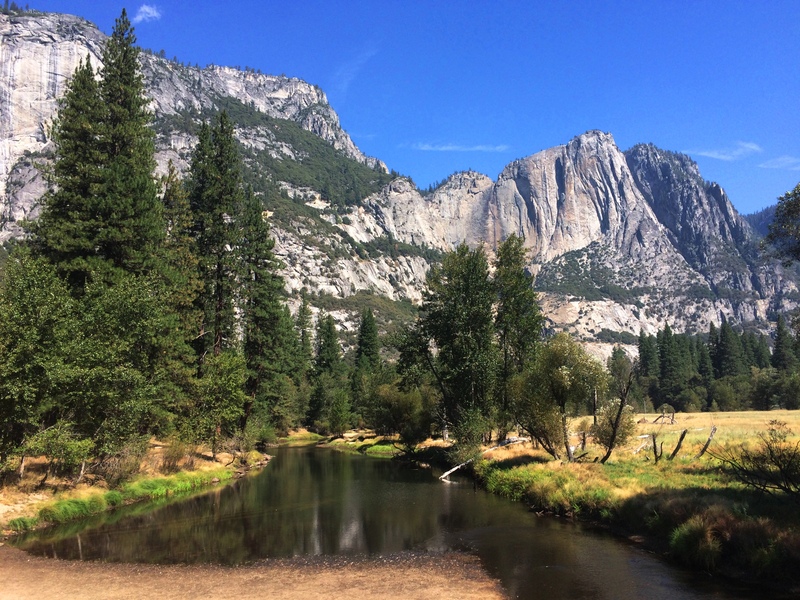 Named after John Muir, America’s famed naturalist and conservationist. 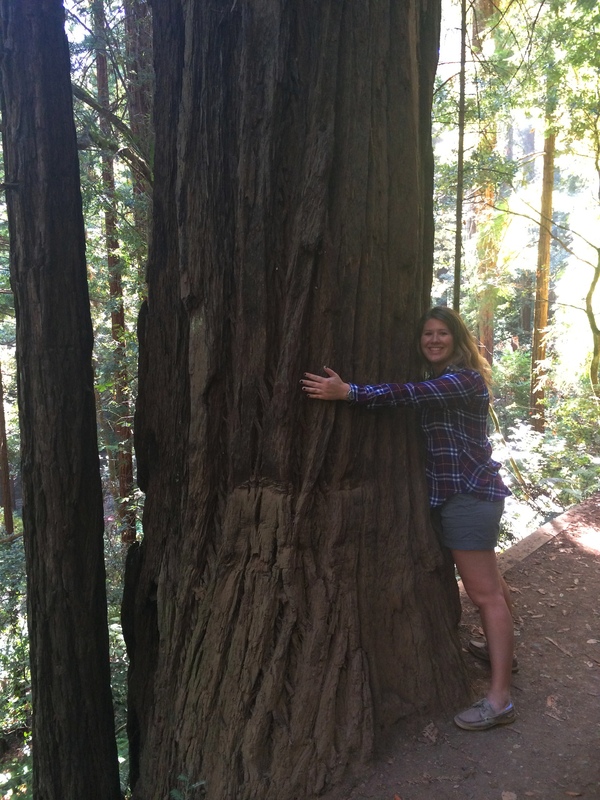 It was such a beautiful way to spend the morning walking in the shade of these huge redwoods! 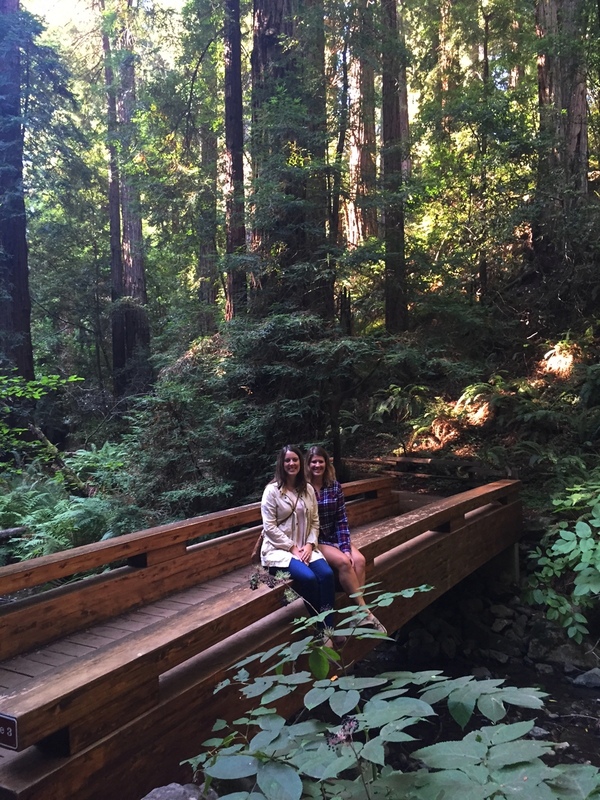 Muir Woods is a forest of coastal redwood trees that are between 500 and 800 years old! 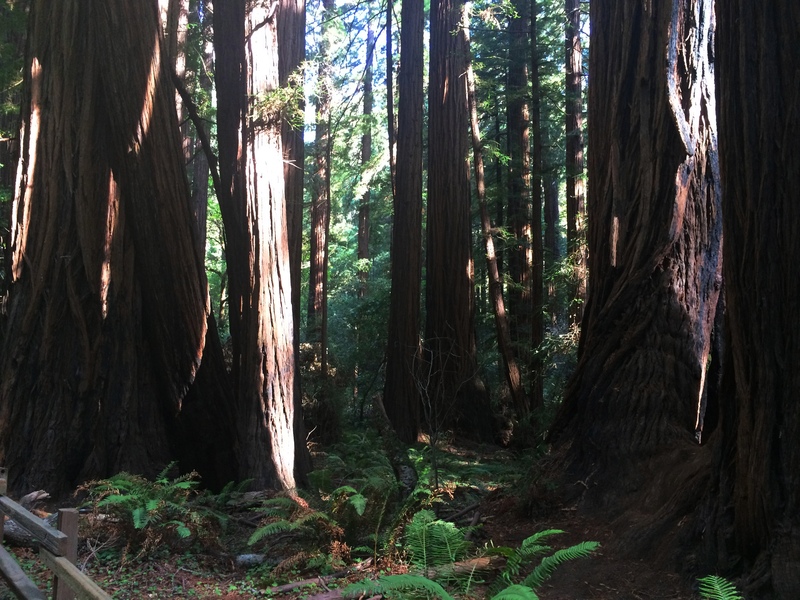 The oldest redwood is at least 1,200 years old! 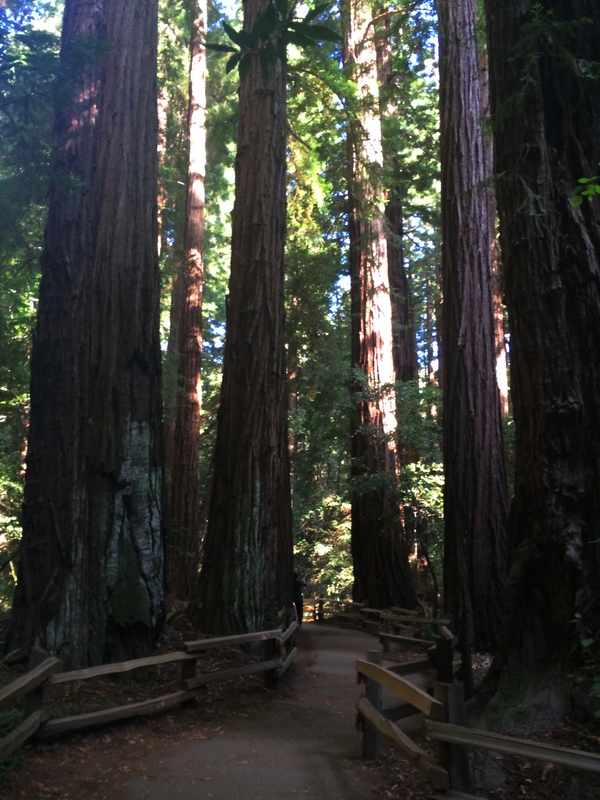 Redwoods can be as tall as 380 feet, and the tallest tree in Muir Woods National Monument is 258 feet. Muir Woods is frequently covered in the marine fog layer due to it’s closeness to the Pacific Ocean, which makes for a wet environment that allows for vigorous growth in the forest. Panoramic from the upper loop of the trail looking down at the forest below. 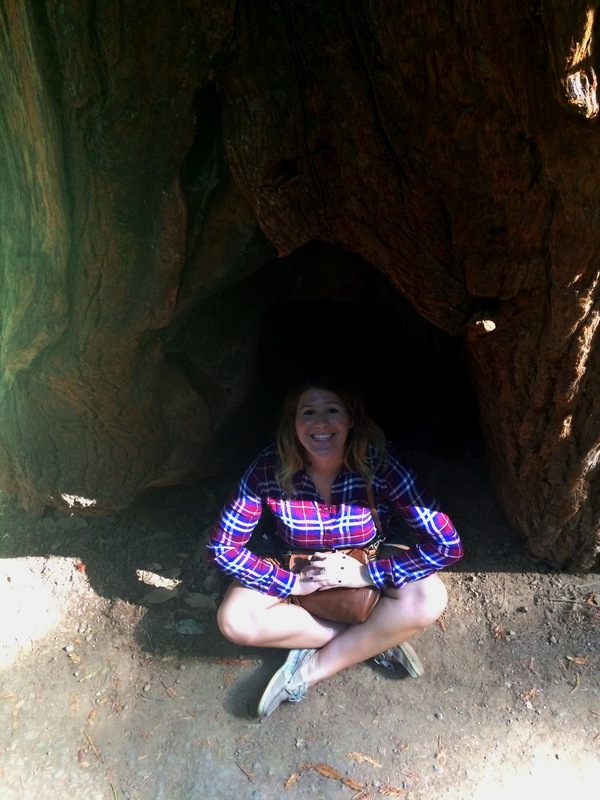 Spending quality time in my tree-pee. “Excuse me, Mr. Deer” said a kid who wanted the deer’s full attention. It worked LOL! 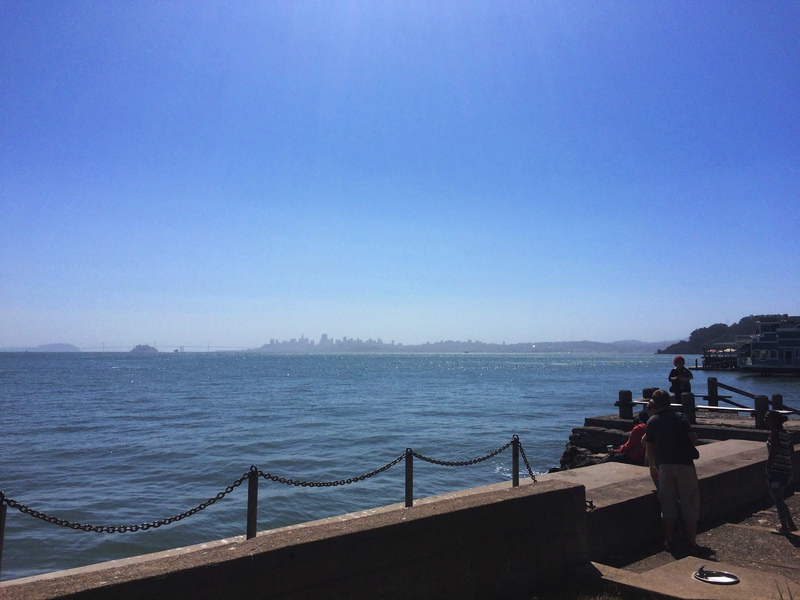 I ended my visit to NorCal with the afternoon in the charming town of Sausalito. 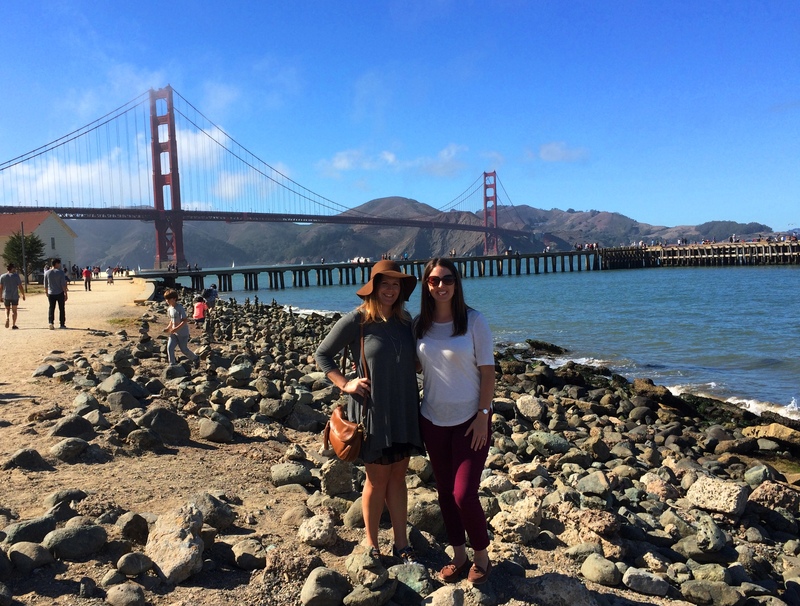 When you cross the Golden Gate Bridge, Sausalito is your first stop. 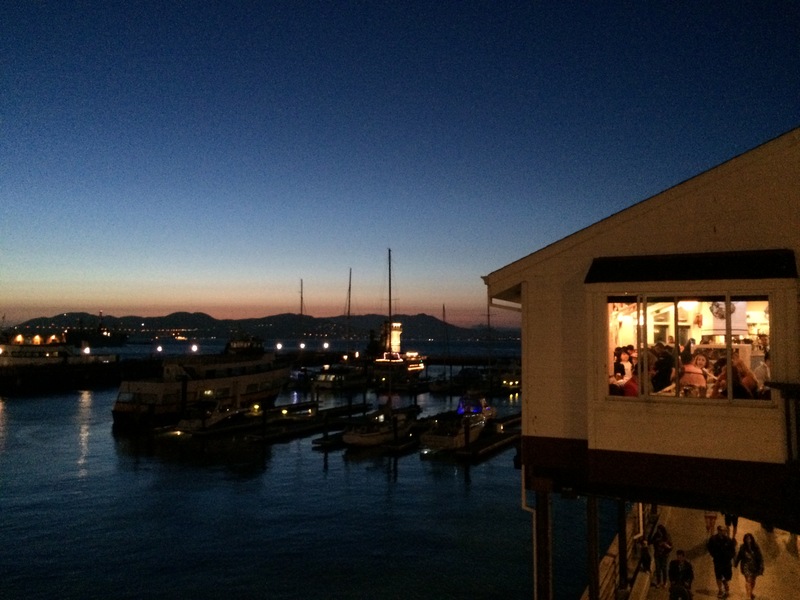 We dined outside at an Italian restaurant overlooking the bay with a foggy view of the San Francisco skyline. It was a beautiful afternoon! 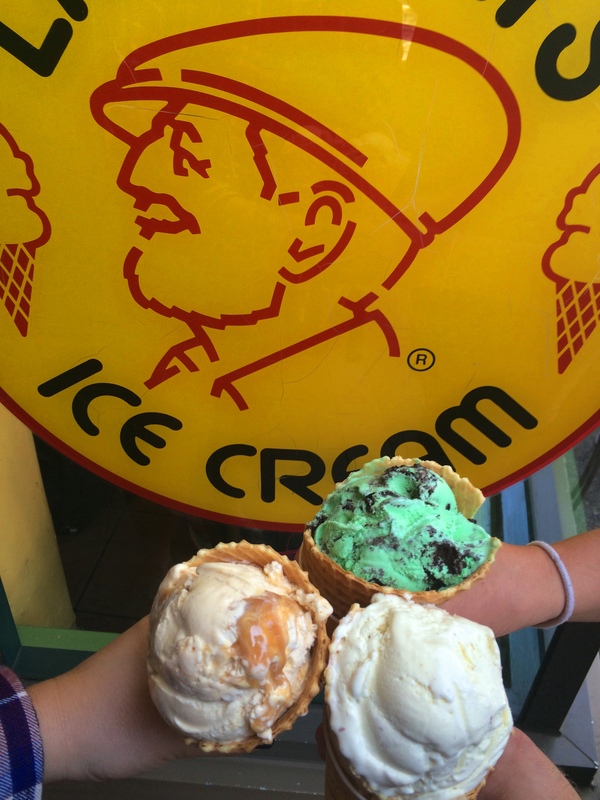 We then treated ourselves to ice cream from a local shop and walked around the town and along the Marina before driving back to San Francisco to drop my friends off at Pier 39 and then make my way home to Los Angeles. 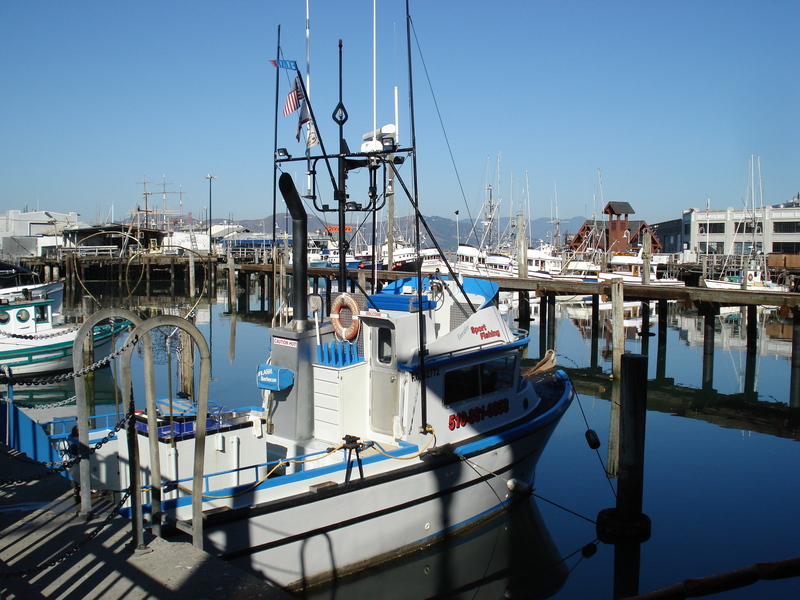 Sausalito grew tremendously during World War II as a shipbuilding center. After the war, an artistic and wealthy community developed out of the abandoned shipyards. 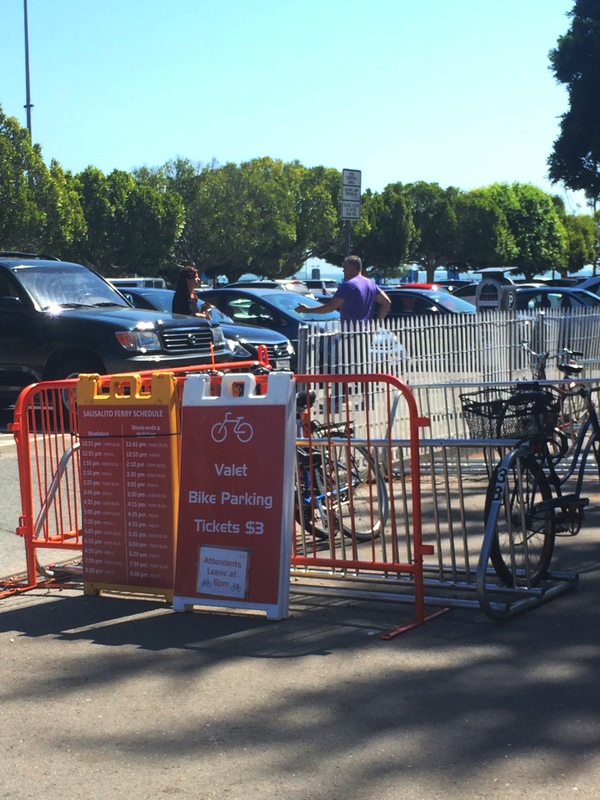 First time seeing a valet for bikes! 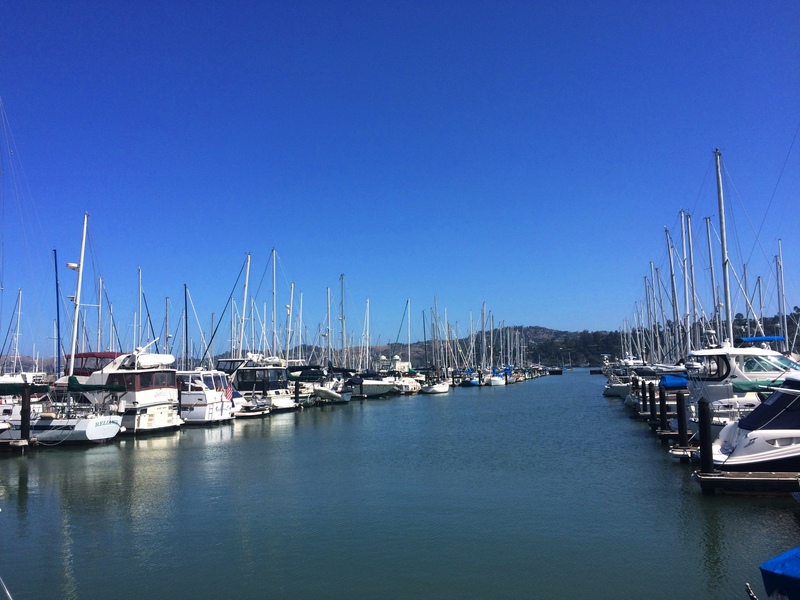 Sausalito is a charming waterfront town featuring local boutique shops, art studios and galleries. Our waterfront view during lunch! 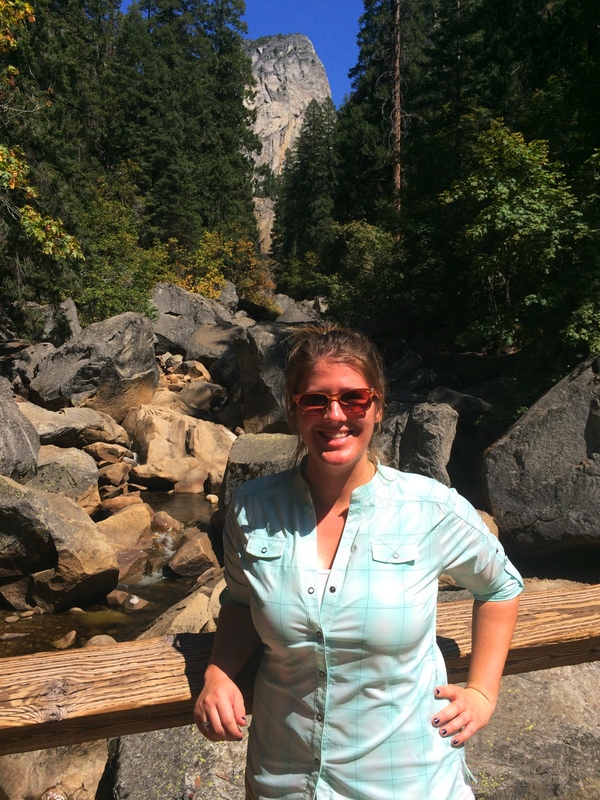 This trip to San Francisco and Yosemite is definitely one of my favorite vacations! 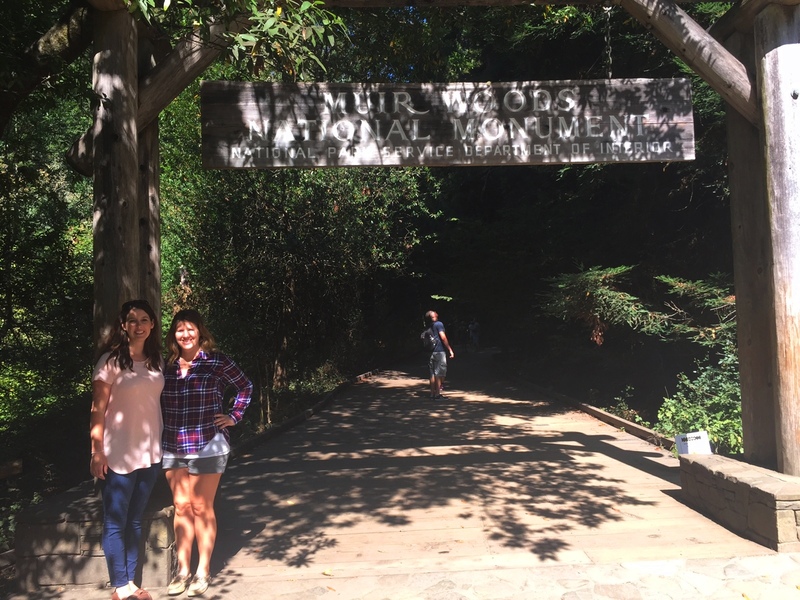 I had an incredibly fun time exploring NorCal with my friends and I was finally able to experience Yosemite National Park and Muir Woods! I can’t wait to continue exploring the gorgeous state of California!